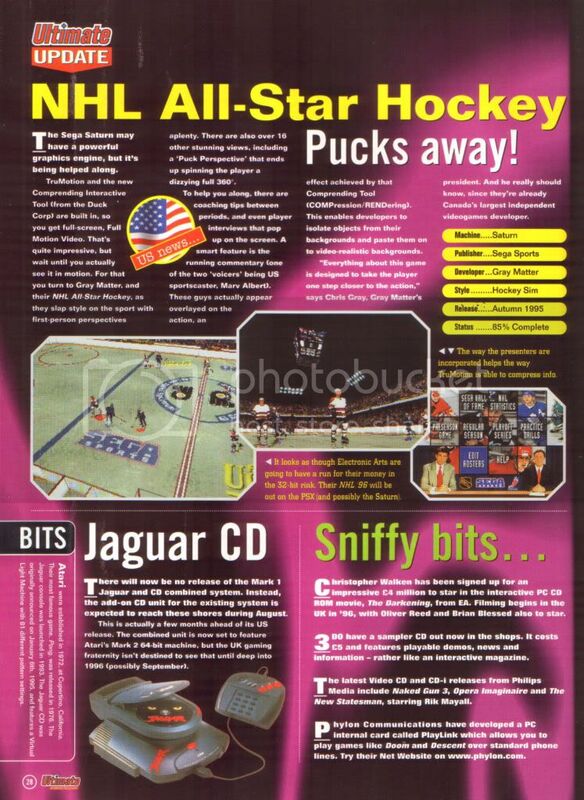 In here I'll be scanning any articles and features I find on the Jaguar in my old games magazines. This post is dedicated to all those who havn't seen the magazines articles. 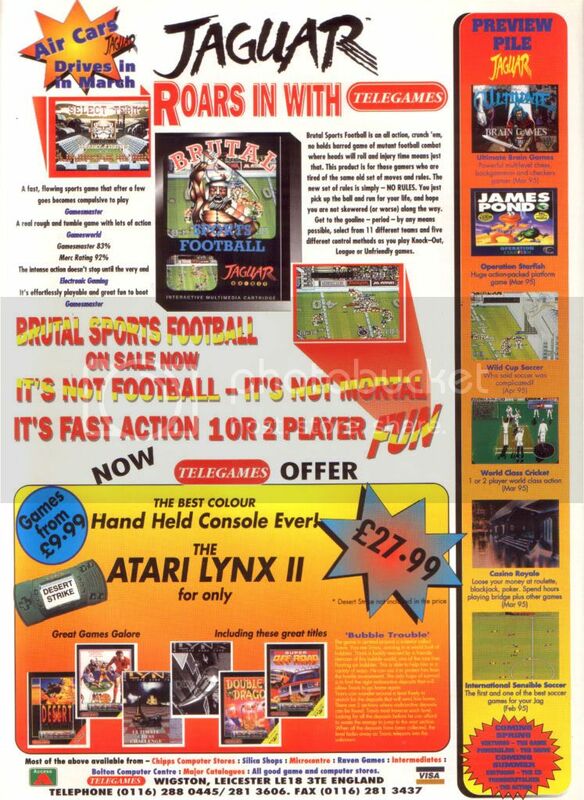 A reading treasure I'm sure you'll all agree? Enjoy with a nice hot cup of coffee or tea. 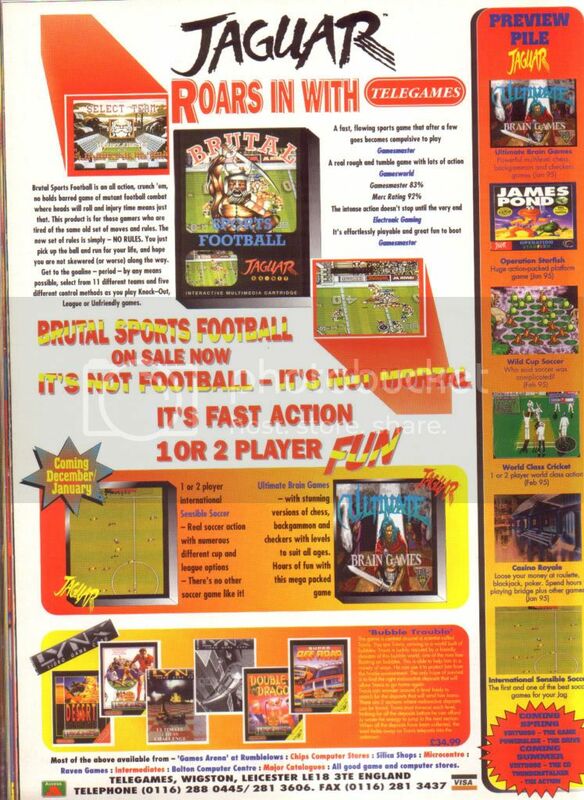 First up is the Future Publishing magazine Ultimate Future Games. 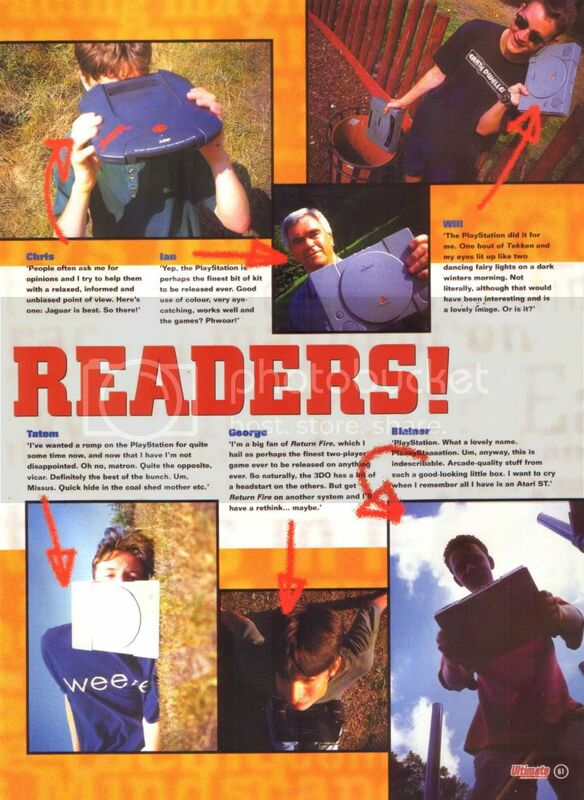 This magazine ran from issue one and ended with the last issue at issue 19. 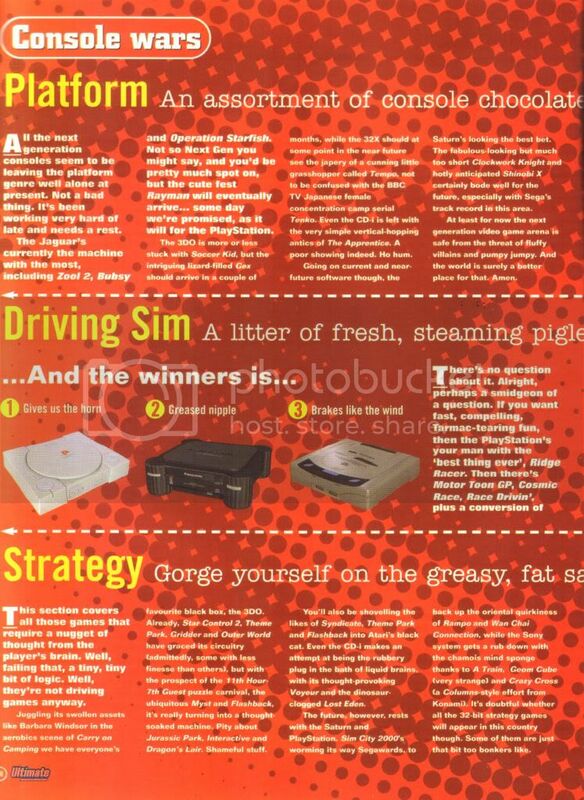 It then merged with Games Master Magazine. 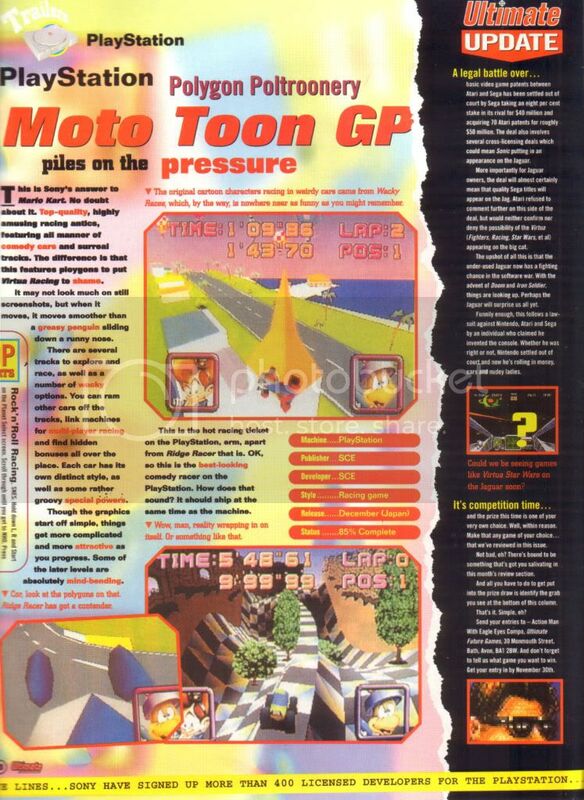 The magazine was a U.K. release. I will start at issue one and work my way up to issue 18 (I don't have the last issue!). 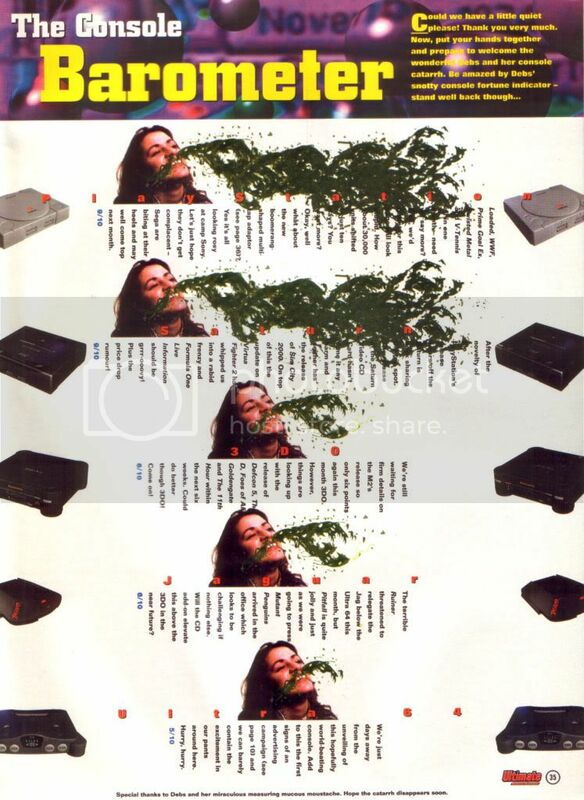 I hope to scan one magazine issue every day or so. 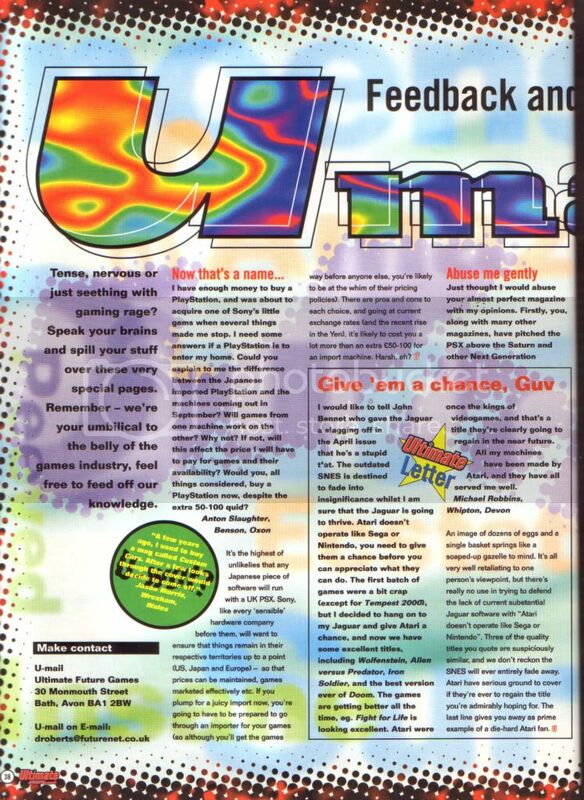 Ultimate Future Games Issue 1 - December 1994. 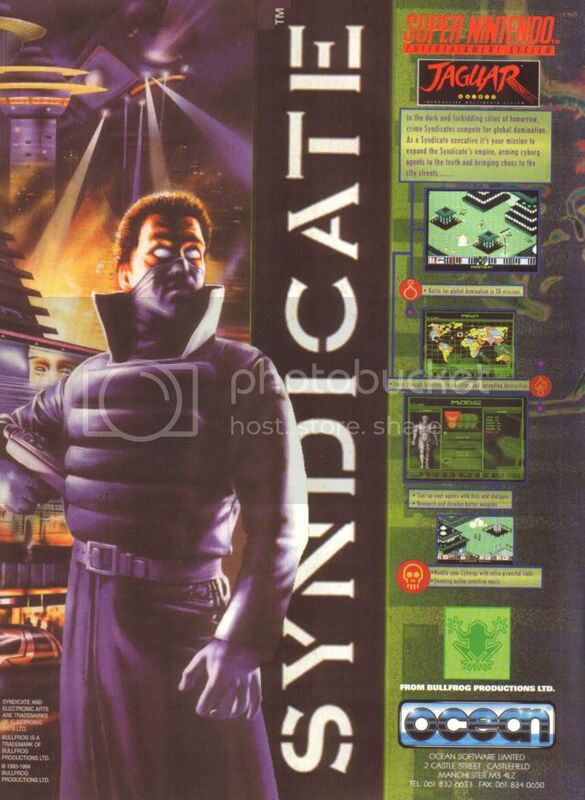 Page 12 - Syndicate Advert bearing Jaguar Logo. 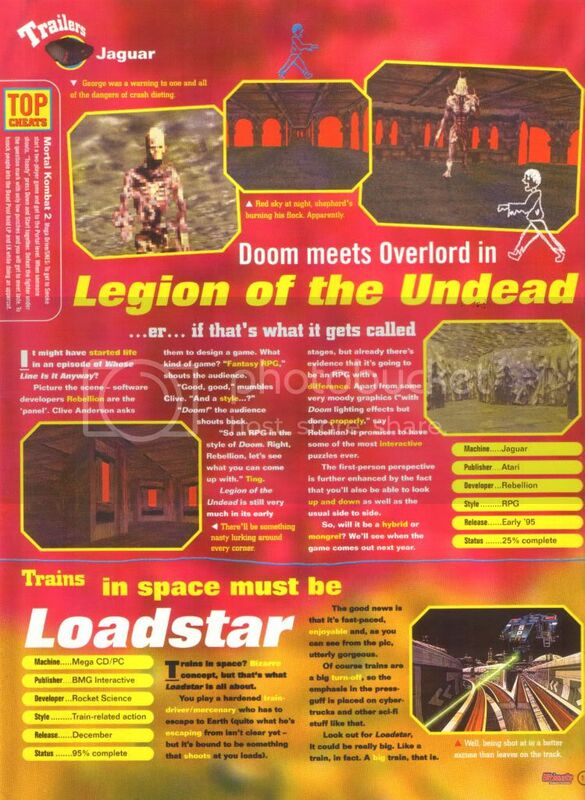 Page 13 - Legion of The Undead Trailer. 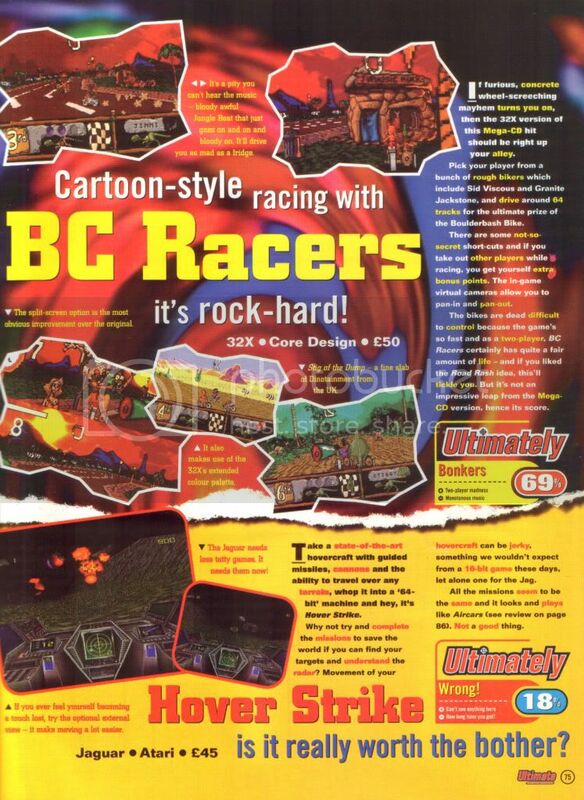 Page 16 - Checkered Flag Trailer. 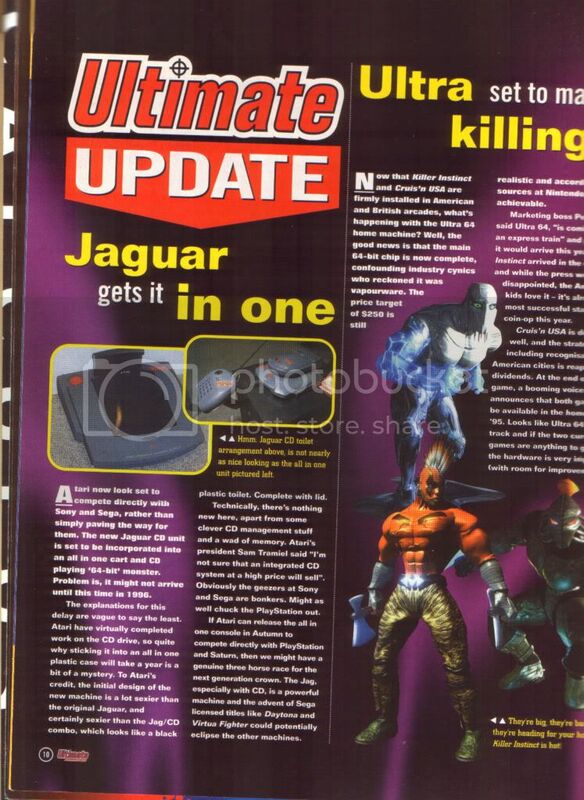 Page 19 - Jaguar Update News. 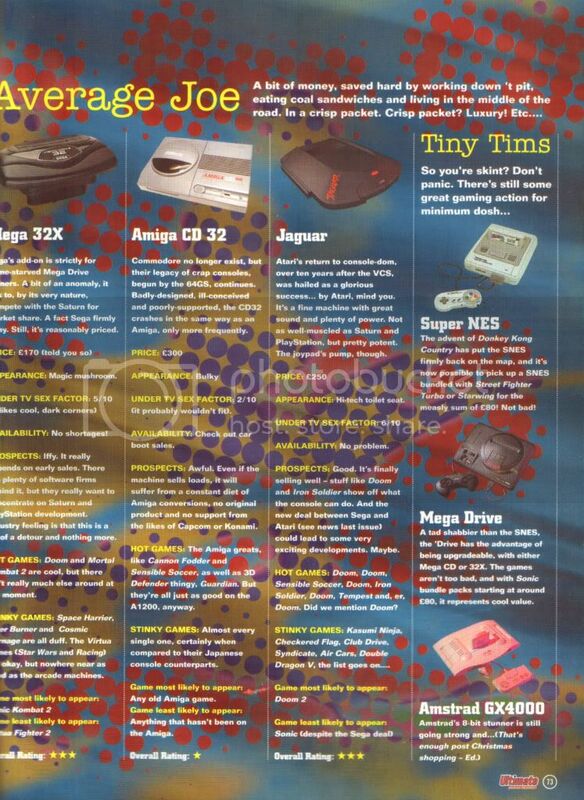 Page 20 - Atari Sega Court Settlement News. 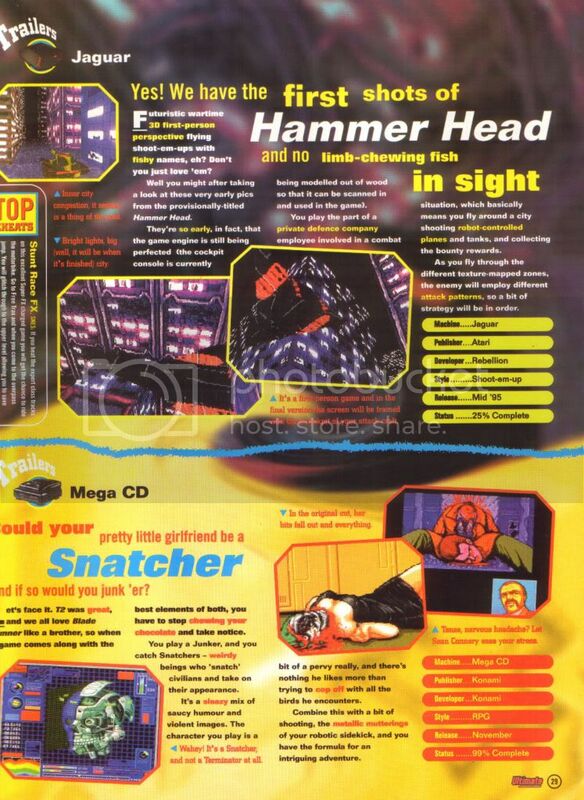 Page 29 - Hammerhead Trailer. 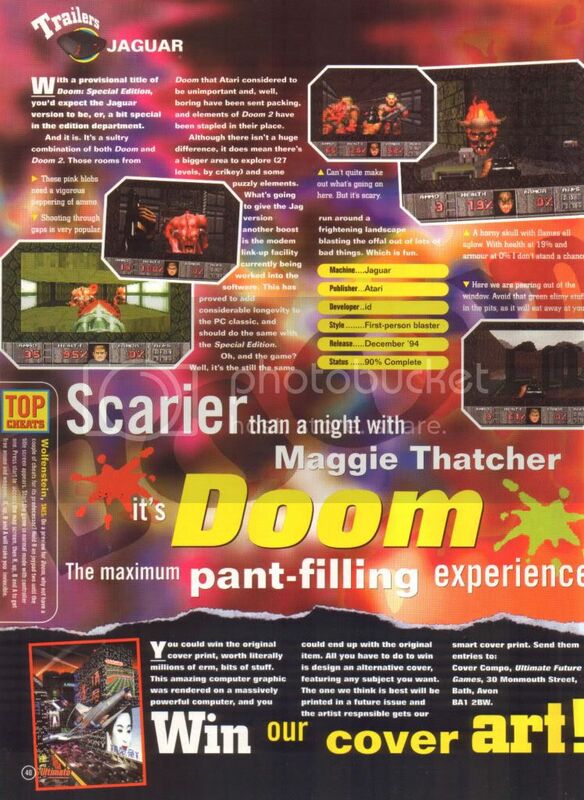 Page 40 - Doom Trailer. 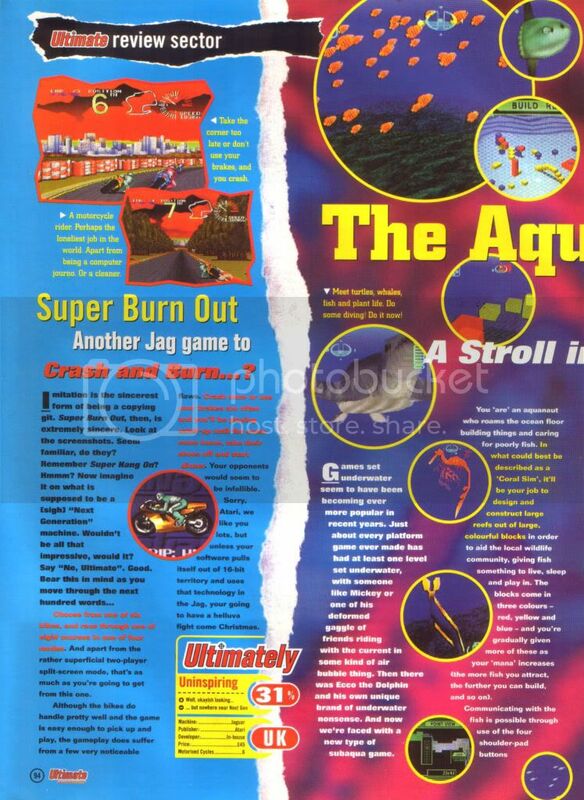 Pages 60 & 61 - Jaguar Feature. 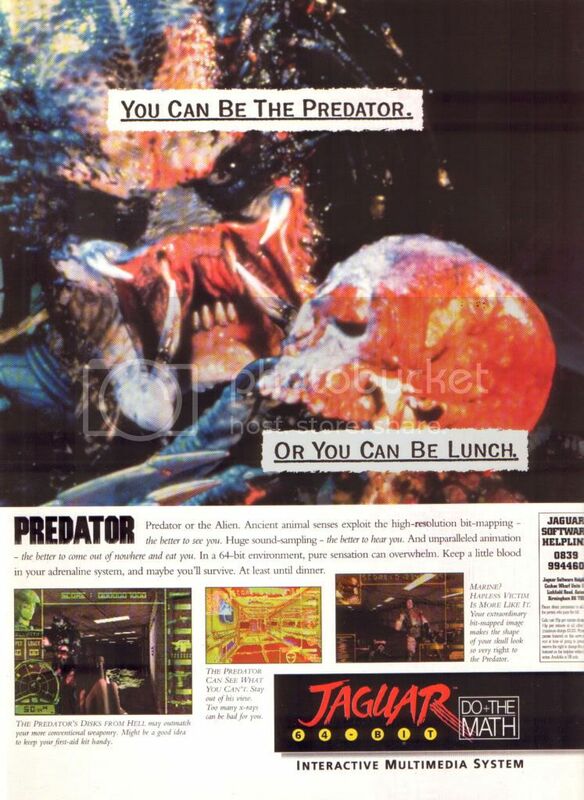 Pages 86 & 87 - Alien Vs Predator Advert. 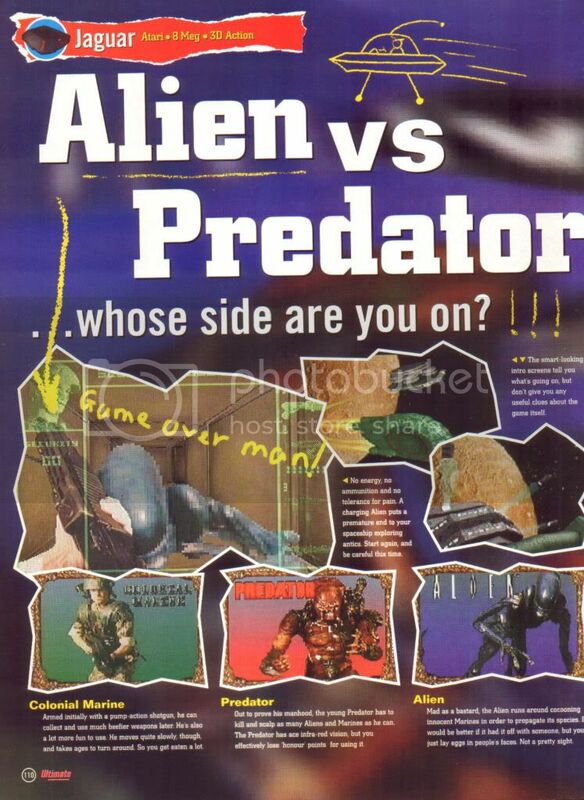 Pages 110 & 111 - Alein Vs Predator Review. 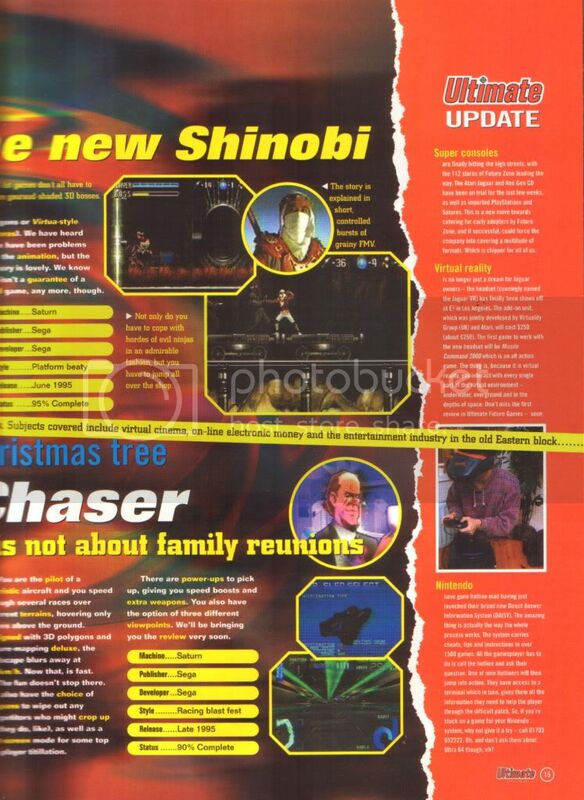 Next scans coming soon, Issue 2 January 1995. Great stuff Lee. 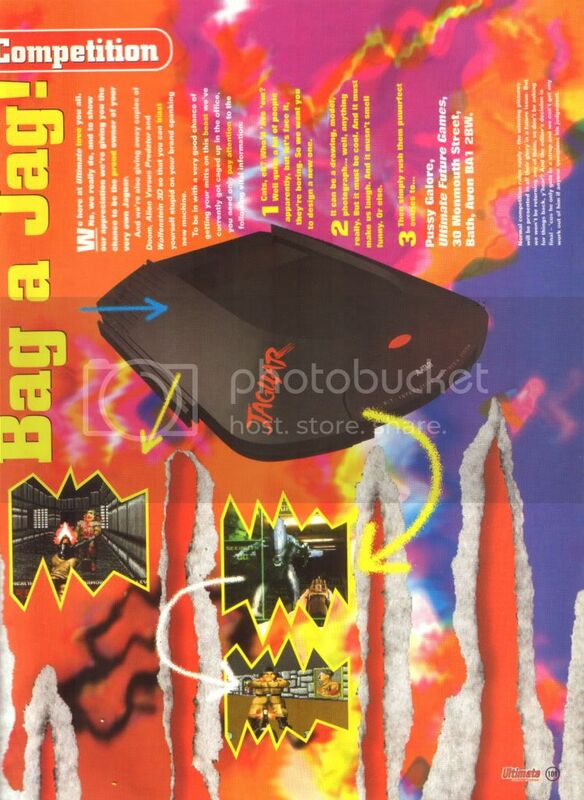 It's really interesting to read about the Jag from a British perspective. 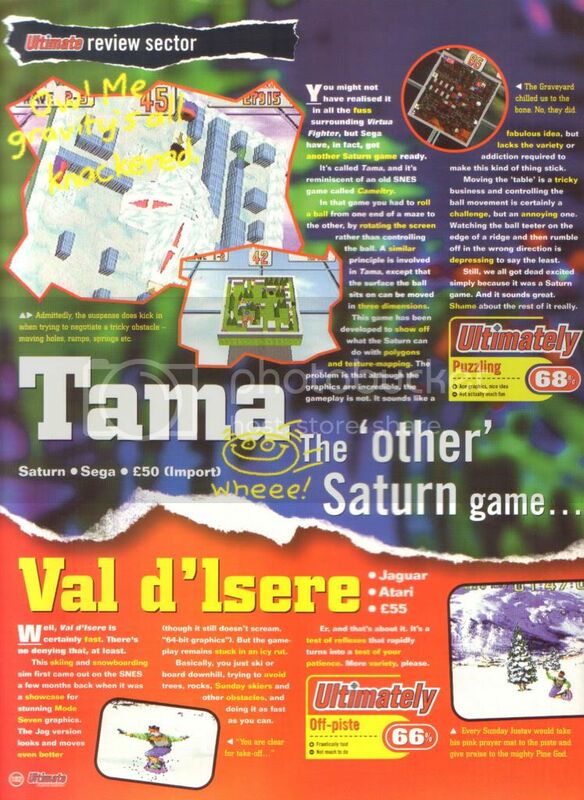 Ultimate Future Games Issue 2 - January 1995. 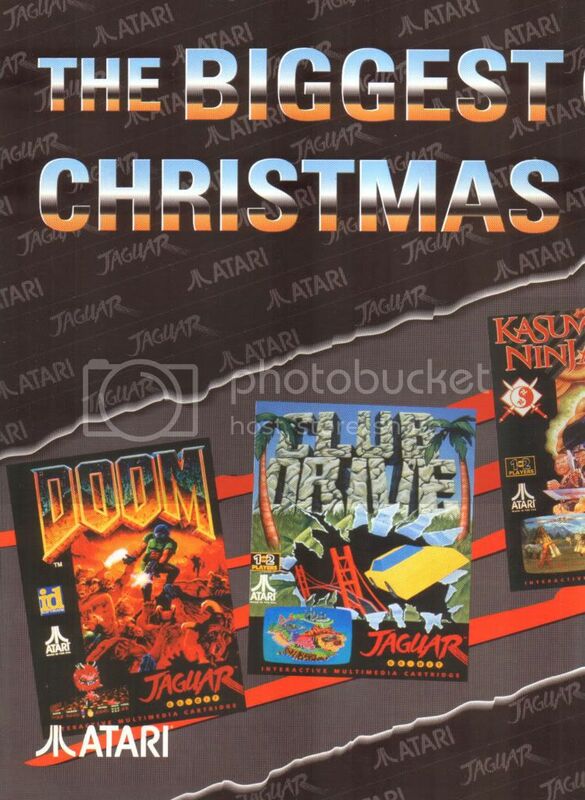 Pages 36 & 37 - Jaguar Games Christmas Advert. 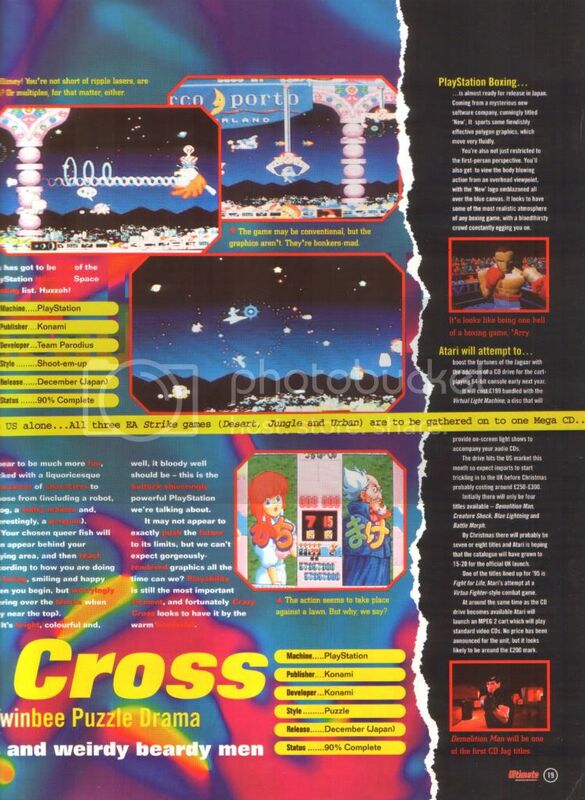 Page 50 - Telegames (UK) Advert. 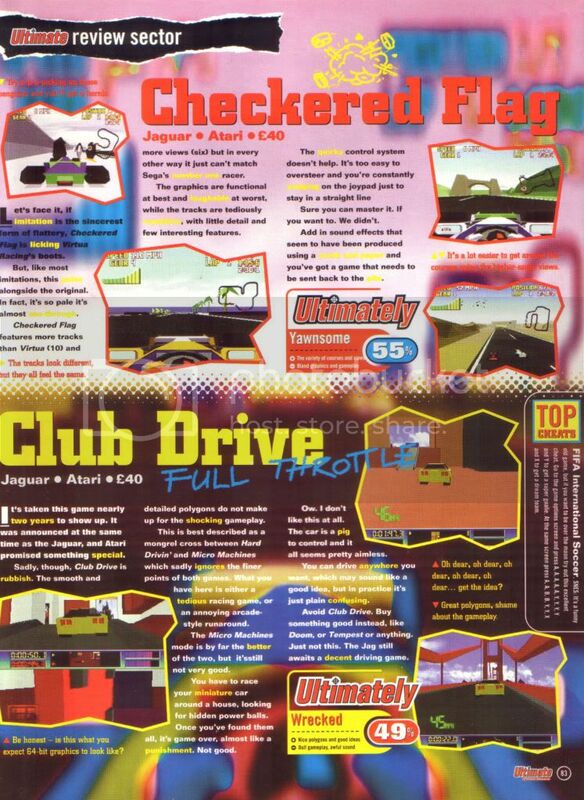 Page 83 - Checkered Flag and Club Drive Reviews. 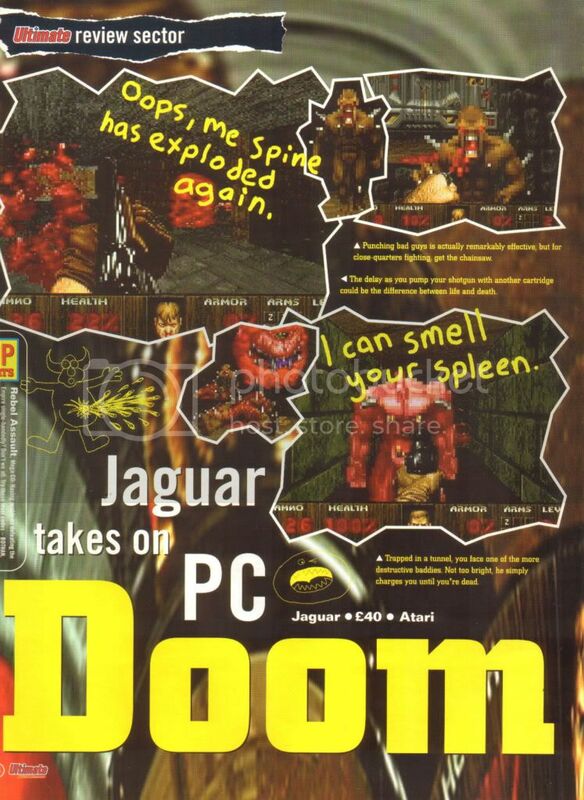 Pages 84 & 85 - Doom Review. 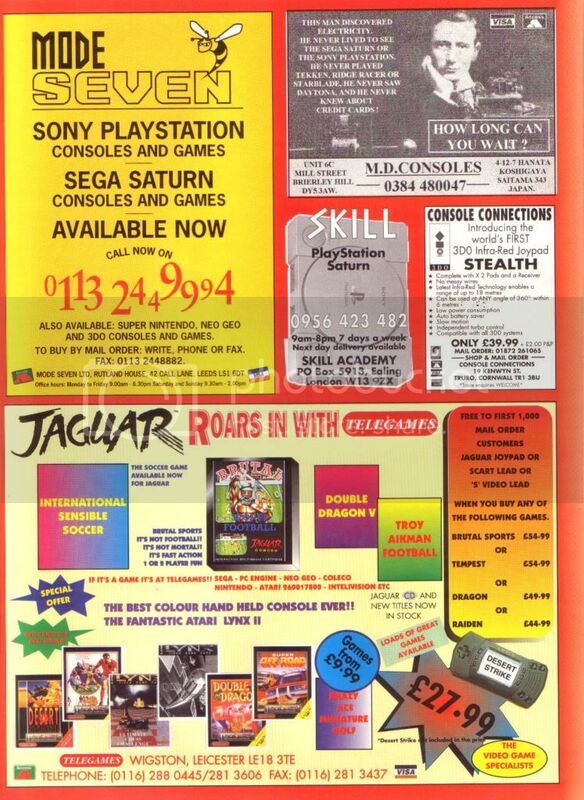 Page 99 - Silica Advert. 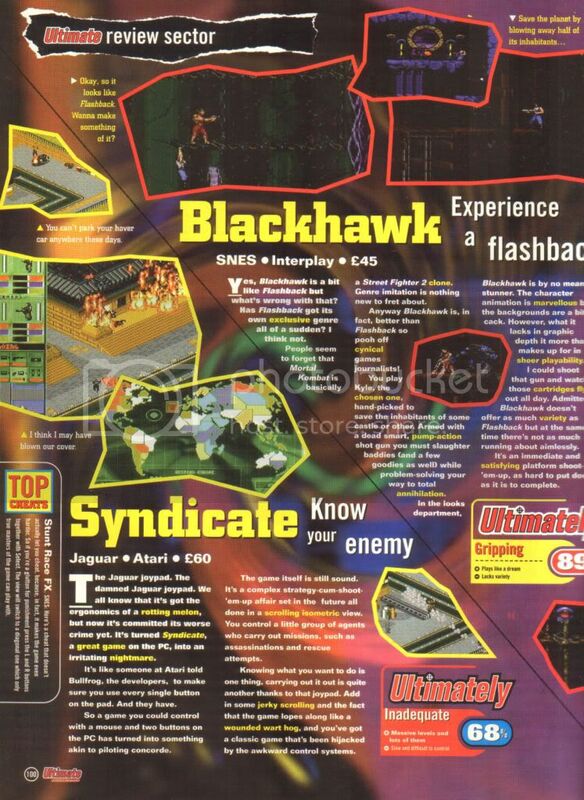 Page 100 - Syndicate Review. 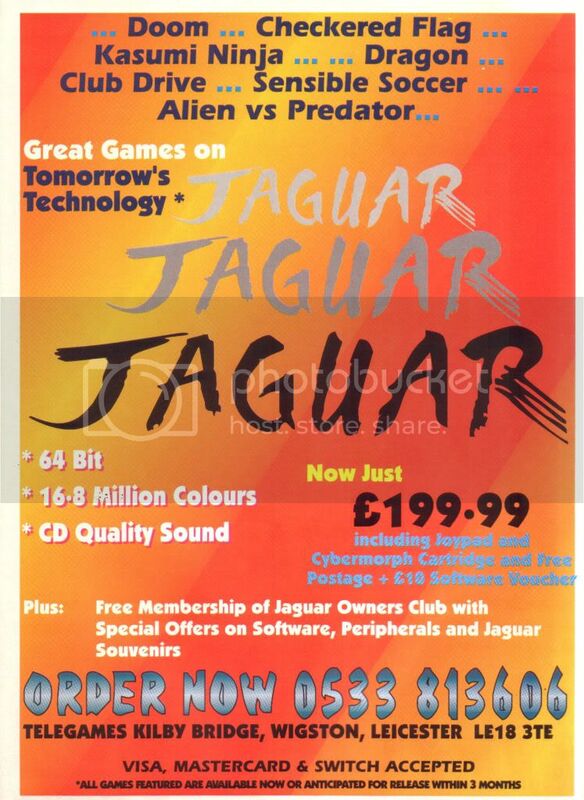 Page 101 - Jaguar Competition. 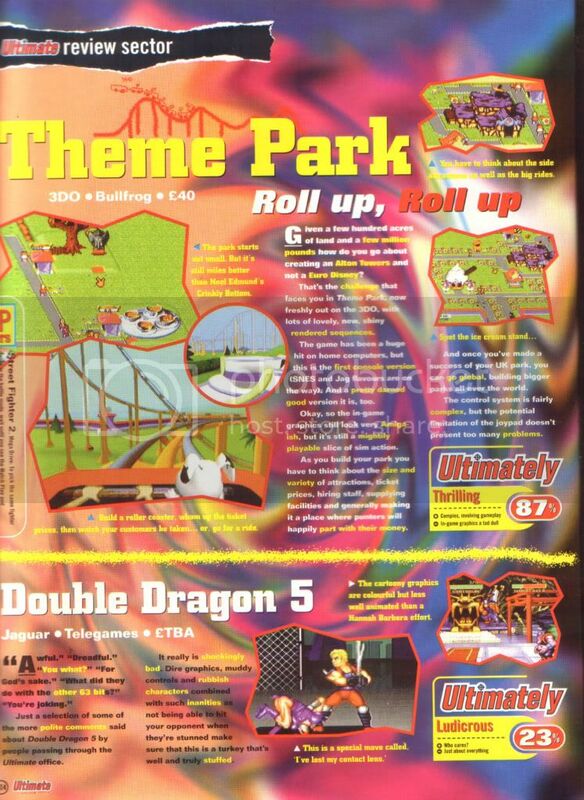 Page 104 - Telegames (UK) Advert. 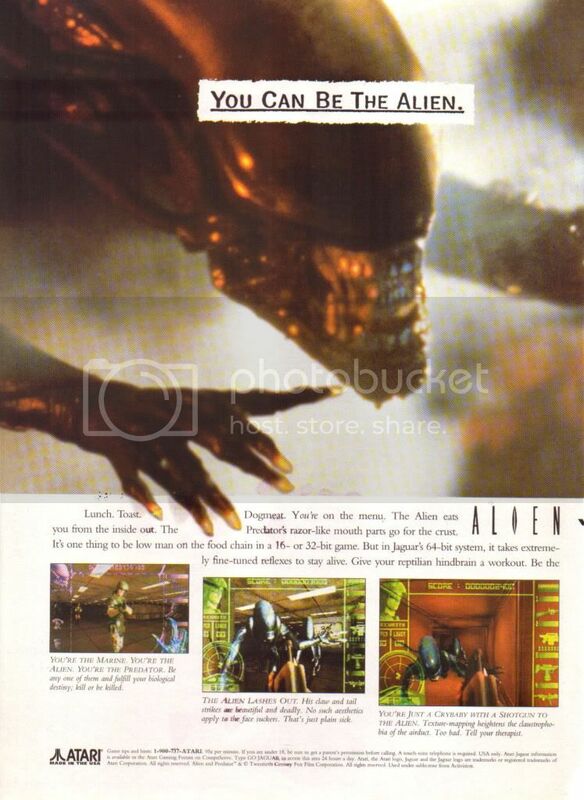 Next scans coming soon, Issue 3 February 1995. 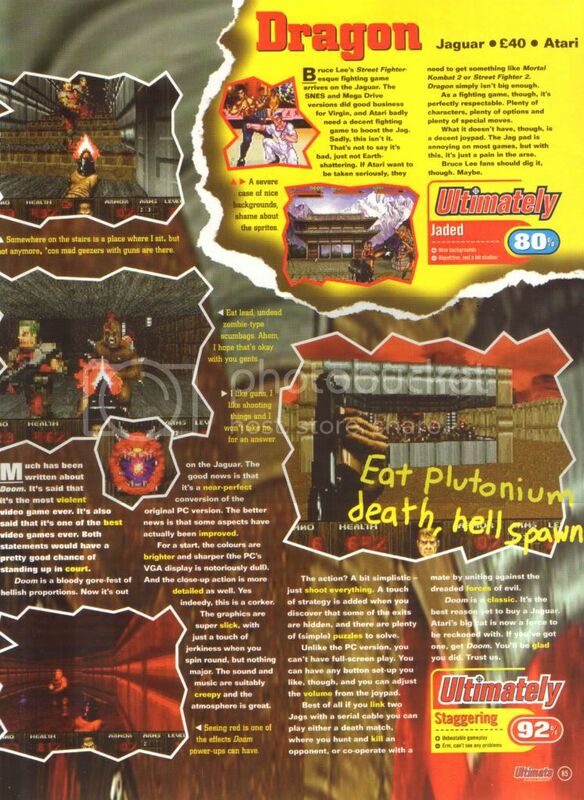 Ultimate Future Games Issue 3 - February 1995. 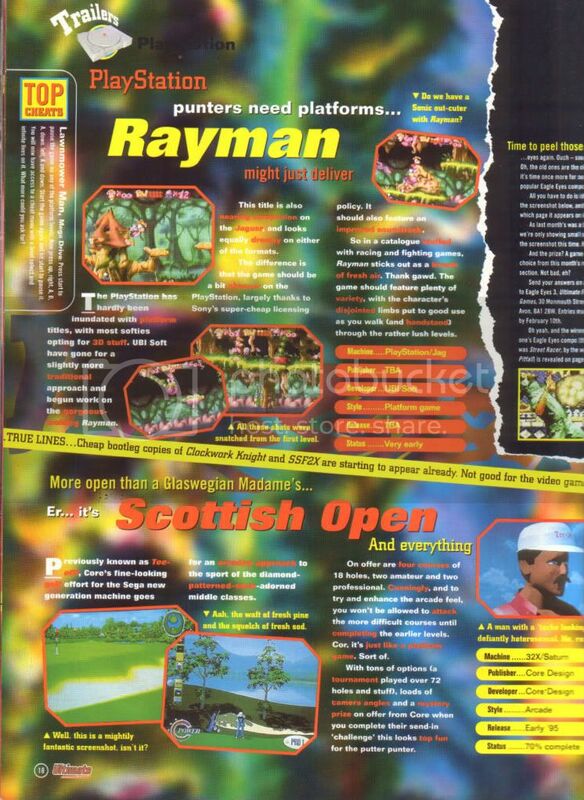 Page 18 - Rayman Trailer. 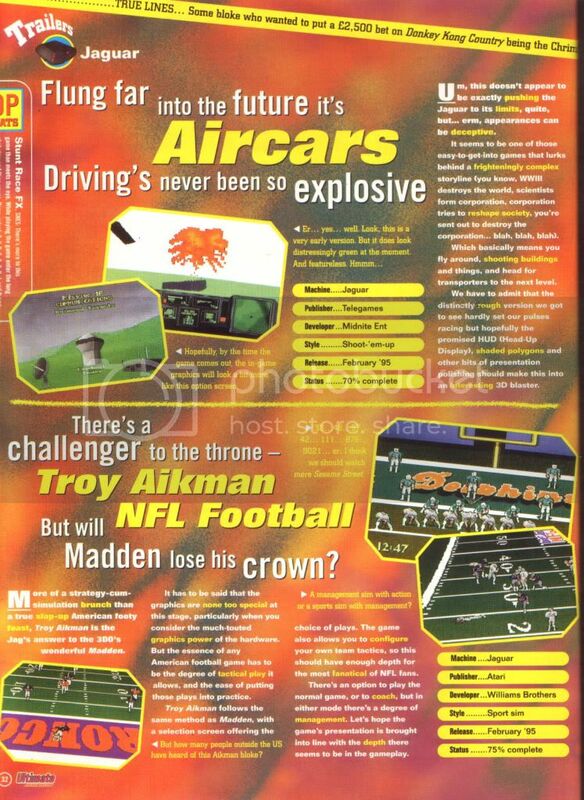 Page 32 - Aircars and Troy Aikman NFL Football Trailers. 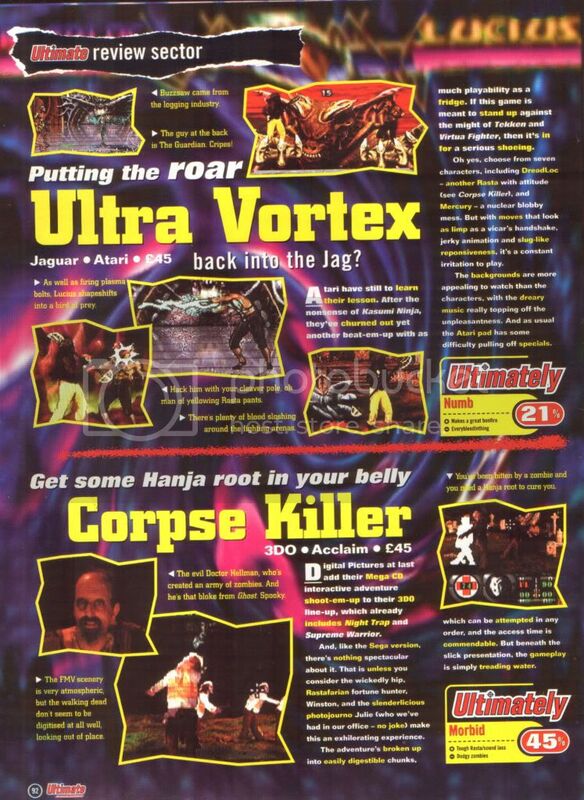 Page 33 - Ultra Vortex Trailer. 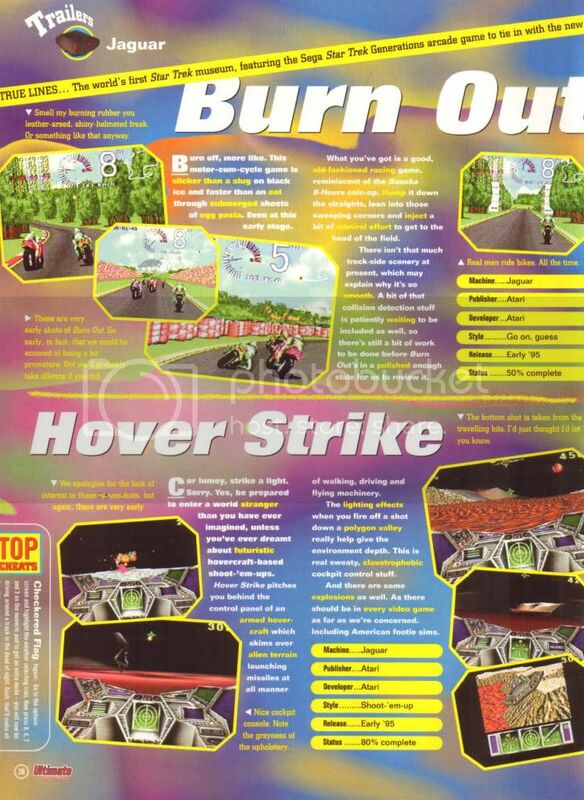 Page 36 - Burn Out and Hover Strike Trailer. 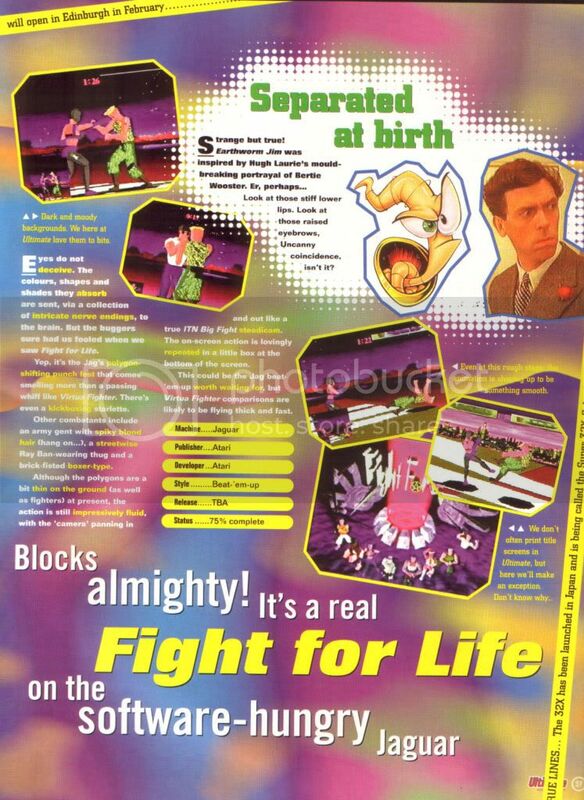 Page 37 - Fight For Life Trailer. 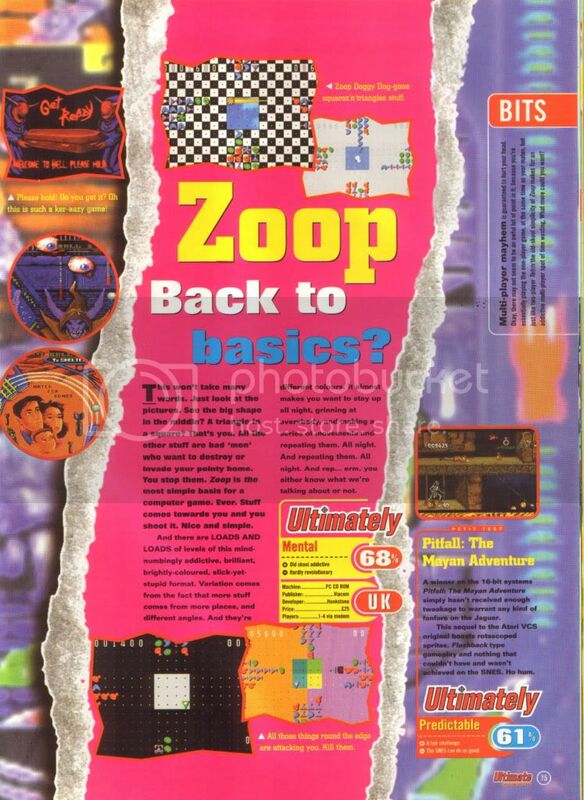 Page 40 - Readers Letter. 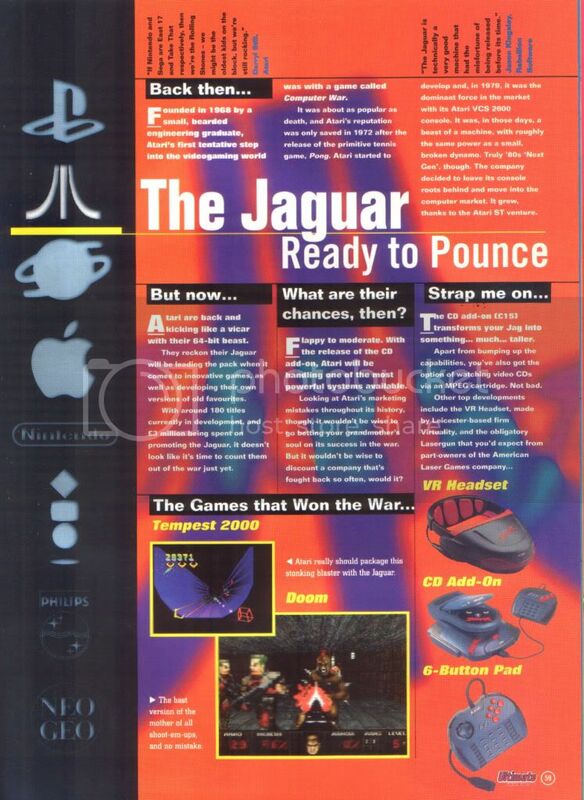 Page 73 - Jaguar Overview. 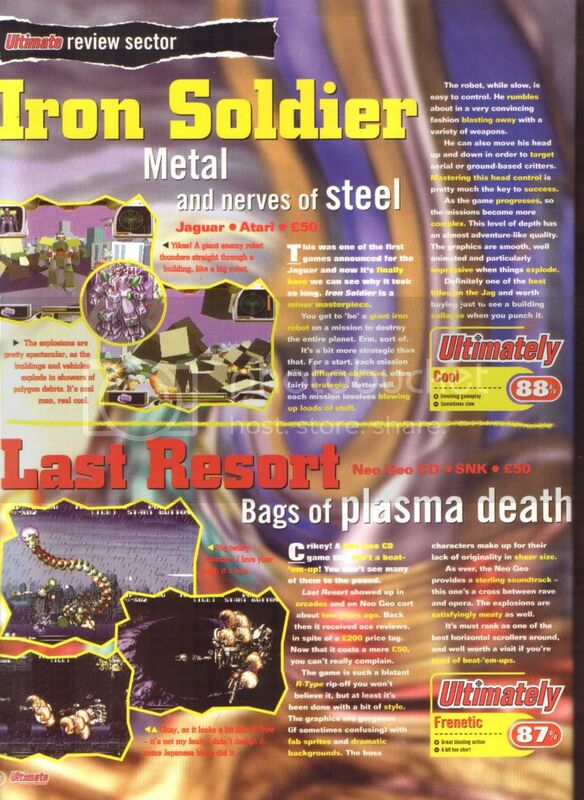 Page 92 - Iron Soldier Review. 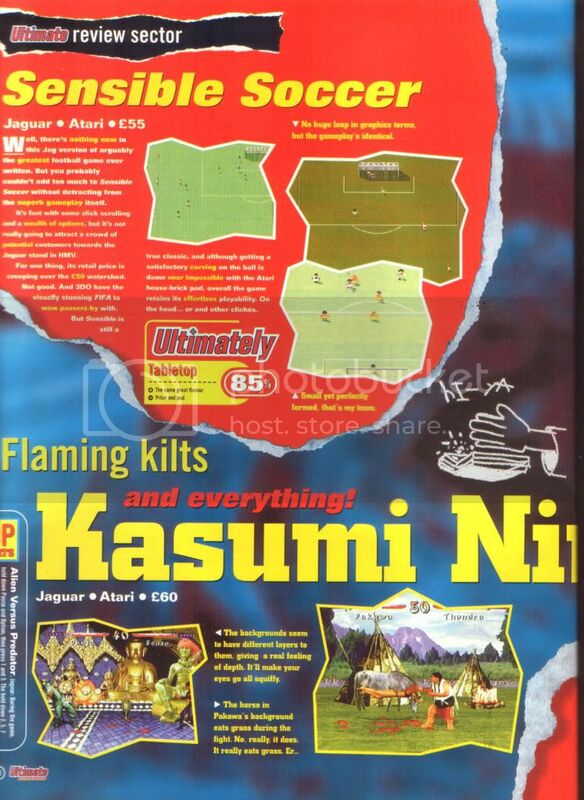 Page 98 and 99 - Sensible Soccer and Kasumi Ninja Reviews. 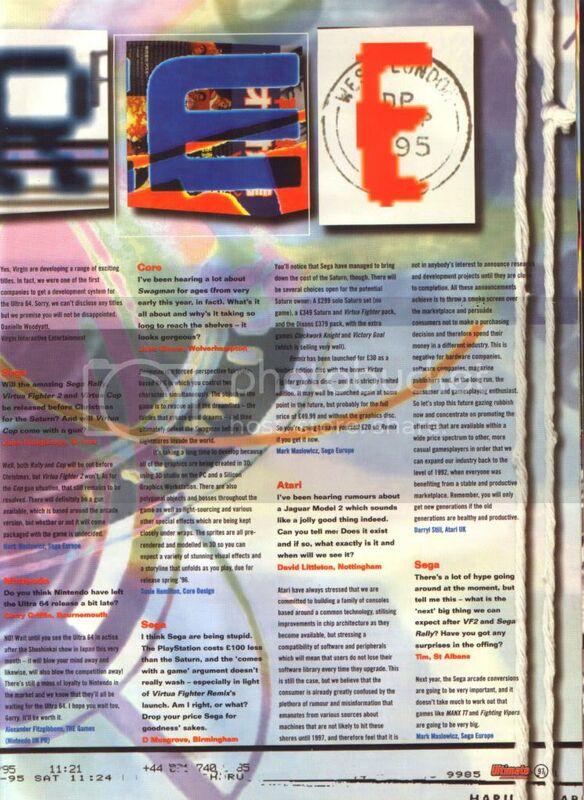 Page 102 - Val D'Isere Review. 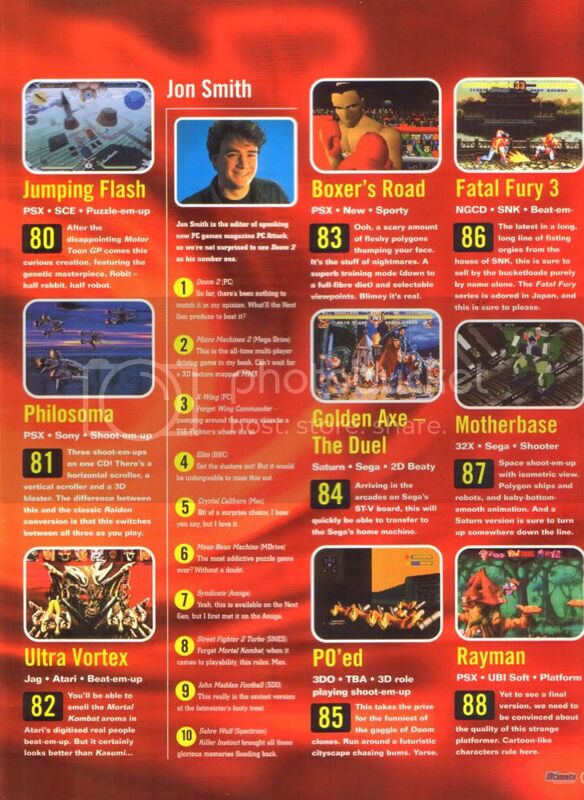 Page 104 - Double Dragon 5 Review. 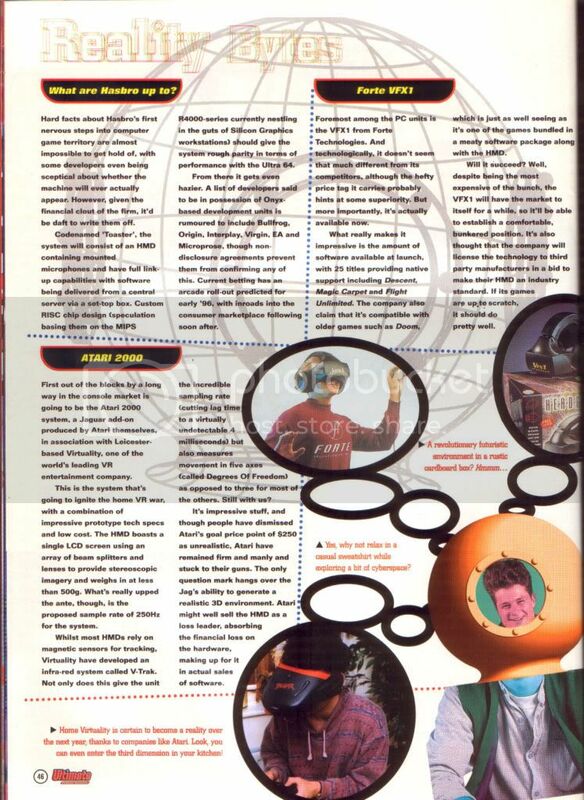 Ultimate Future Games Issue 4 - March 1995. 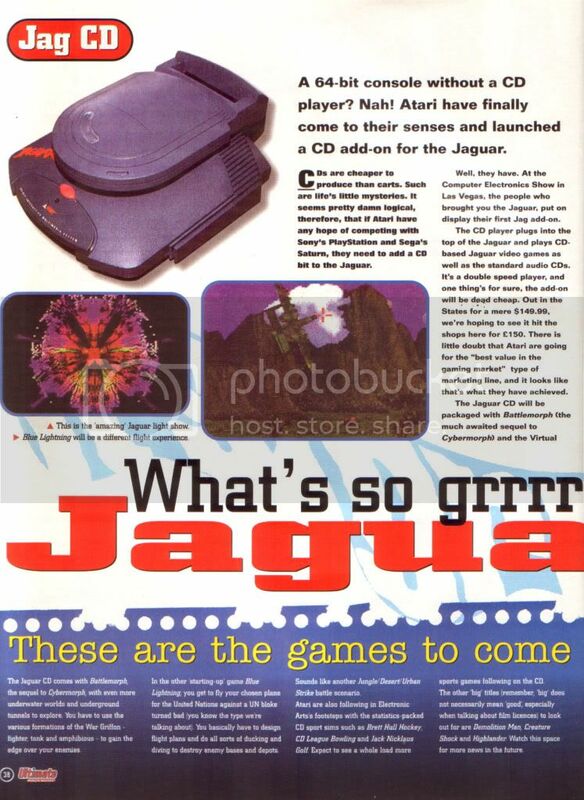 Page 10 - Jaguar Duo News. Pages 13 and 14 - Las Vegas C.E.S. Report. 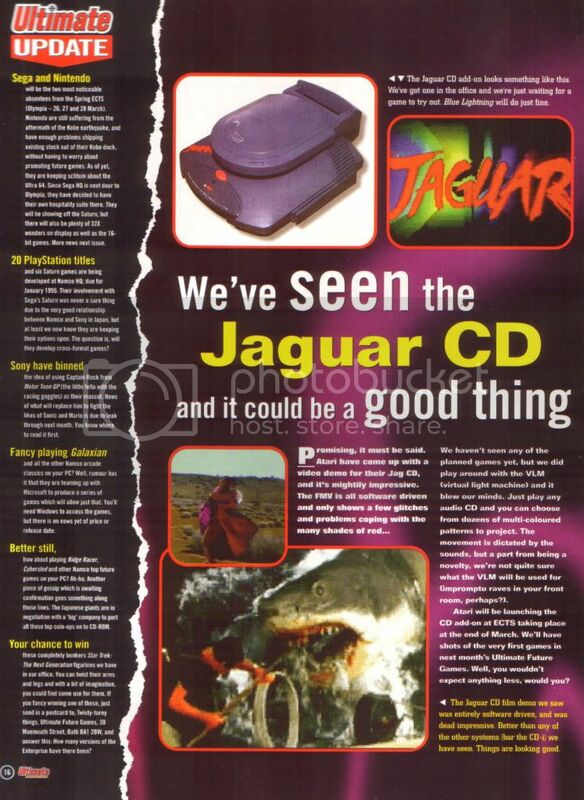 Pages 38 and 39 - Jaguar CD Article. 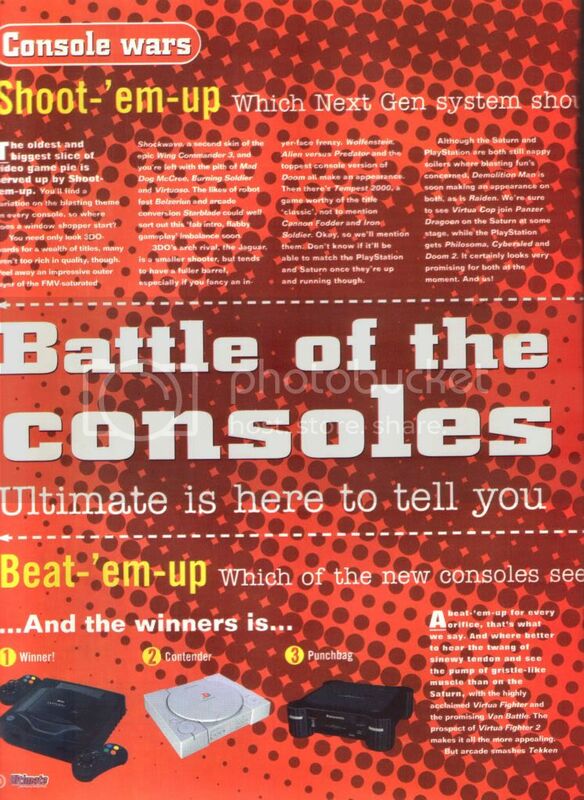 Pages 58, 59, 60 and 61 - Battle Of The Consoles. 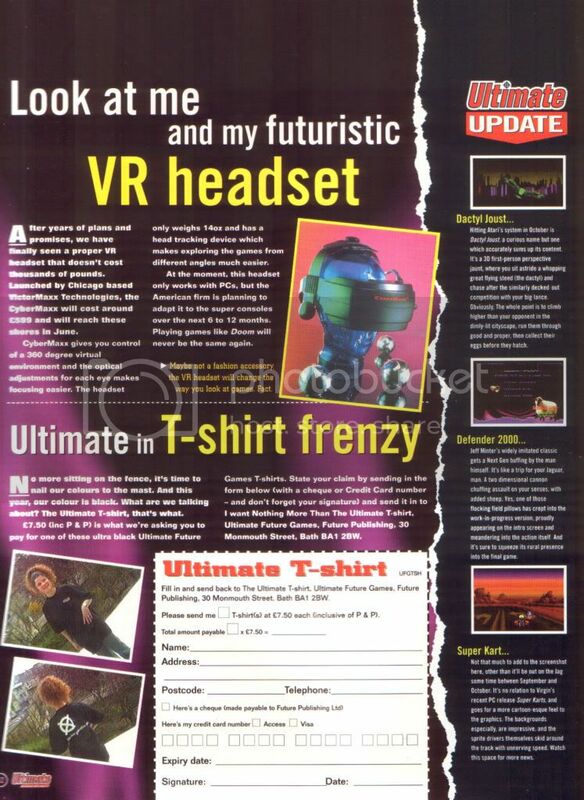 Ultimate Future Games Issue 5 - April 1995. 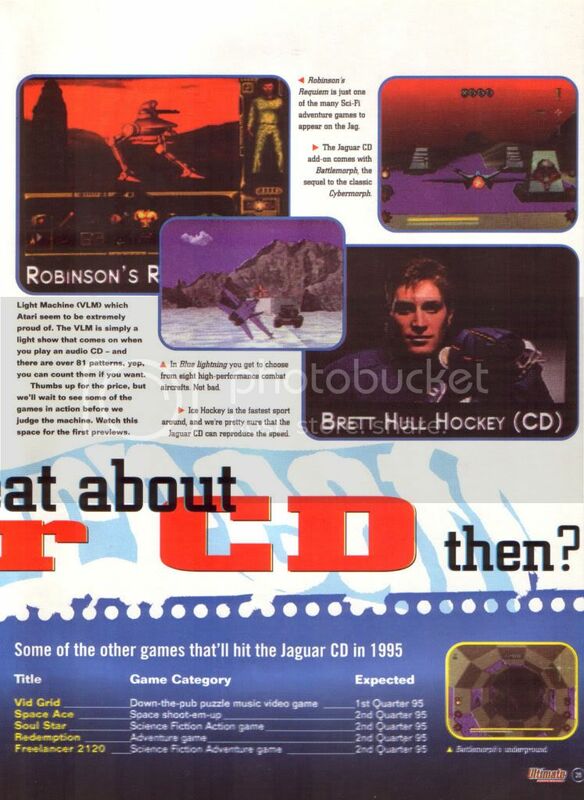 Page 16 and 17 - Jaguar CD News. Page 28 - Darryl Still Letter. 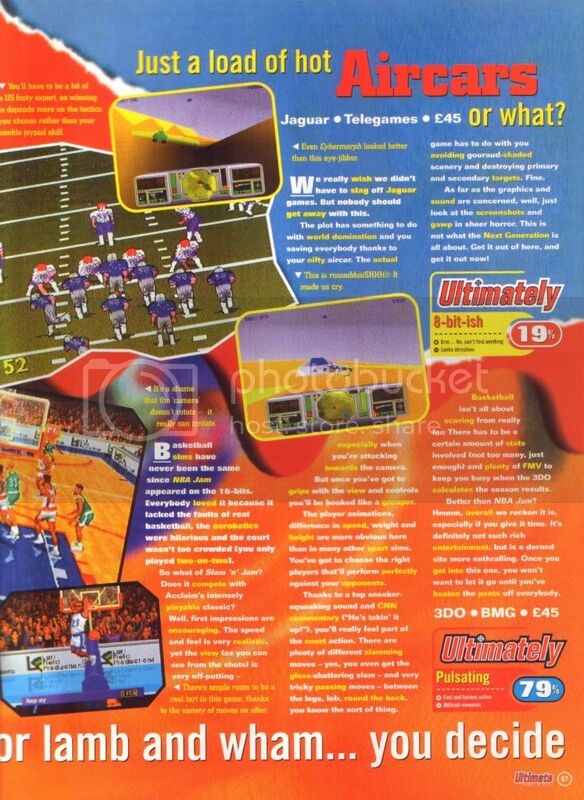 Page 42 - Telegames (UK) Advert. 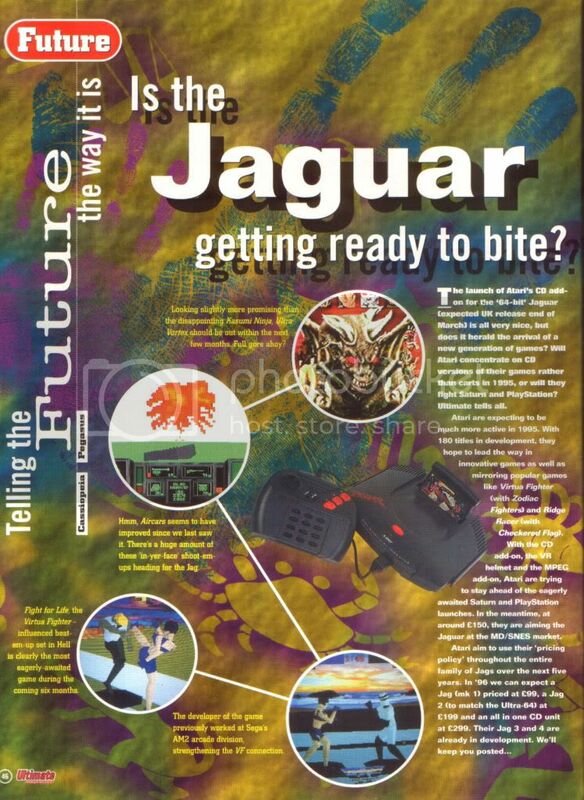 Page 46 - Jaguar Future News. 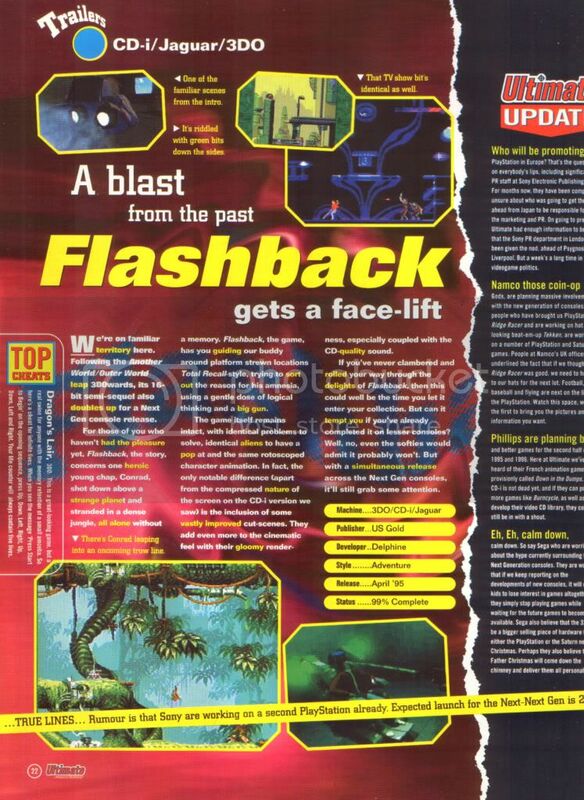 Ultimate Future Games Issue 6 - May 1995. 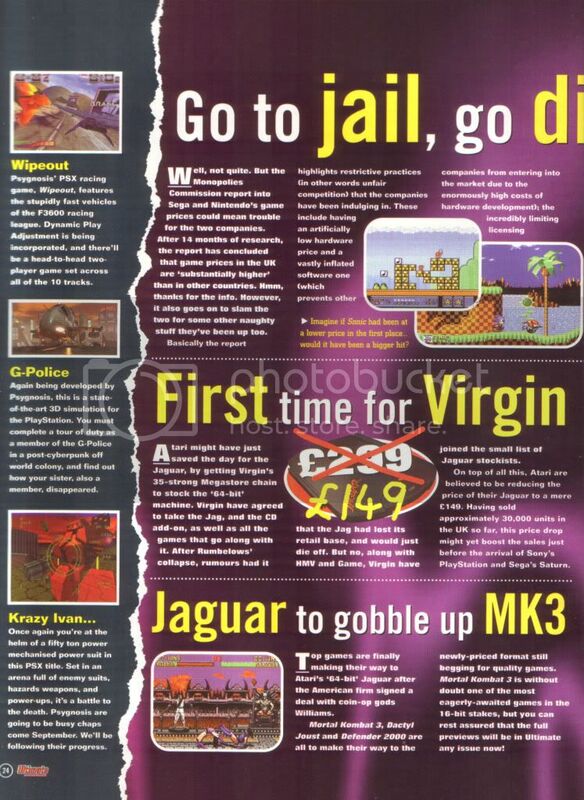 Page 24 - Price Slash and MK3 News. Page 29 - Readers Letter. 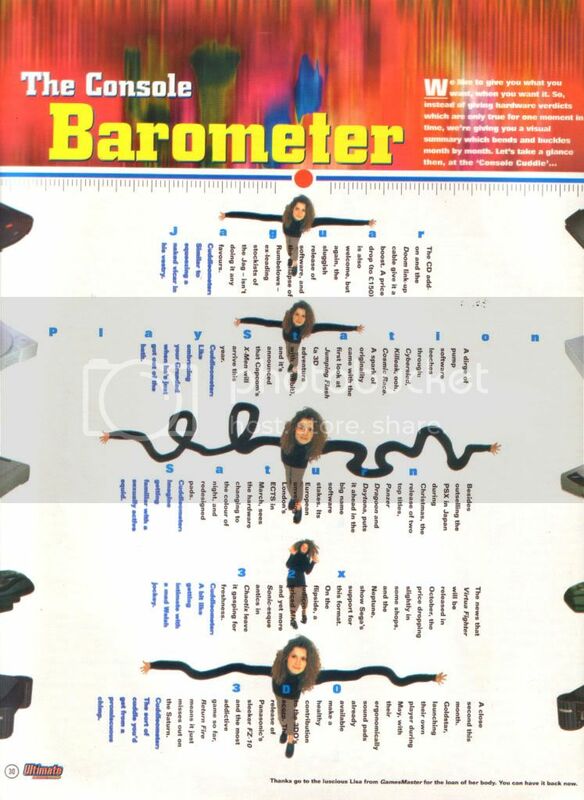 Page 30 - Console Barometer. 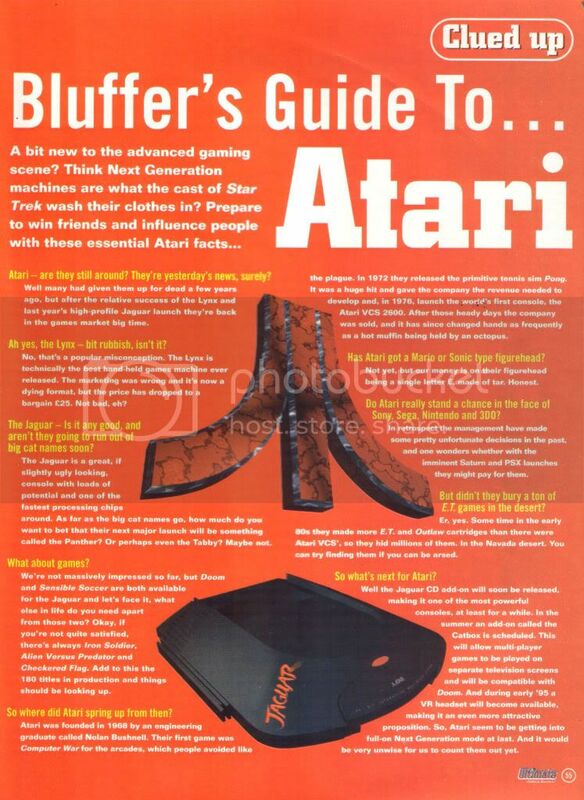 Page 55 - Bluffers Guide To Atari. 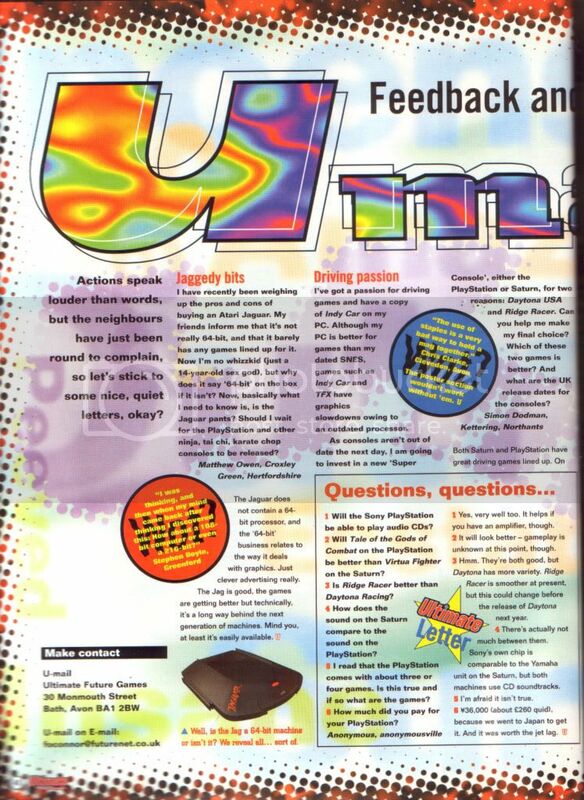 Ultimate Future Games Issue 7 - June 1995. 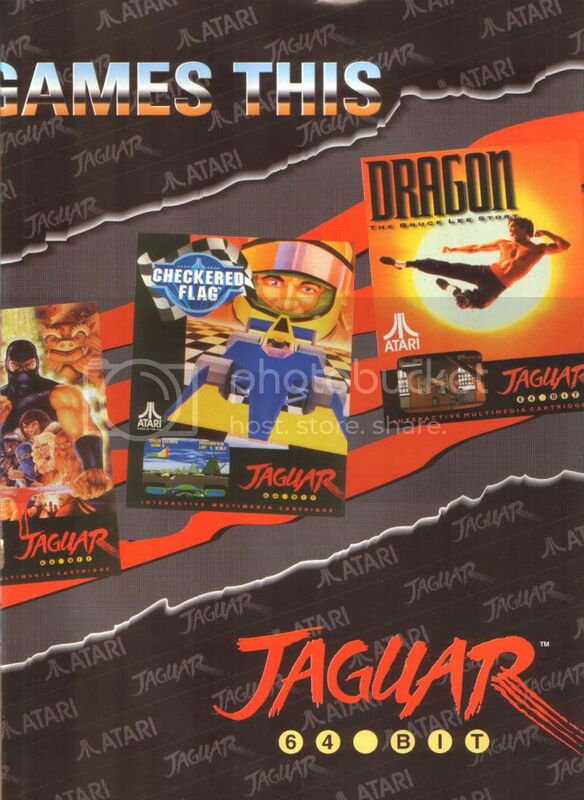 Pages 15, 16, 17, 19 and 20 - Jaguar Games in The Top 100 Games of The Future. 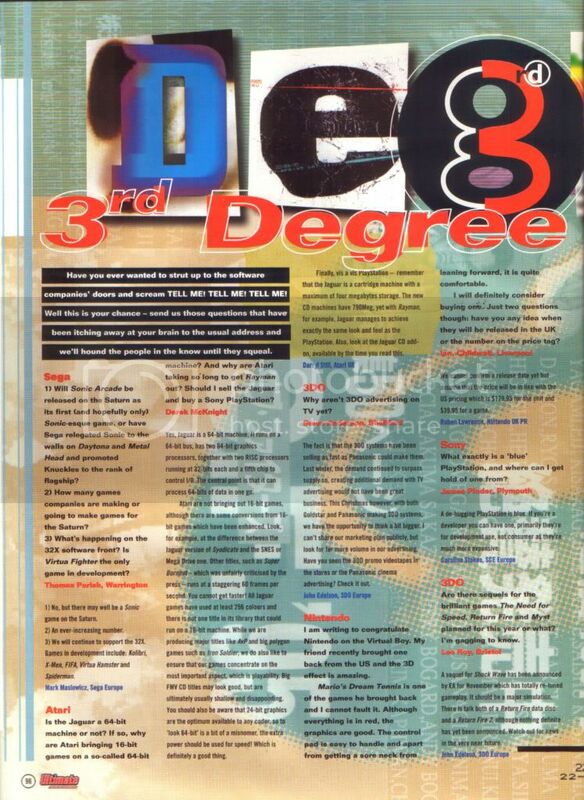 Page 23 - NBA Tournament Edition News. 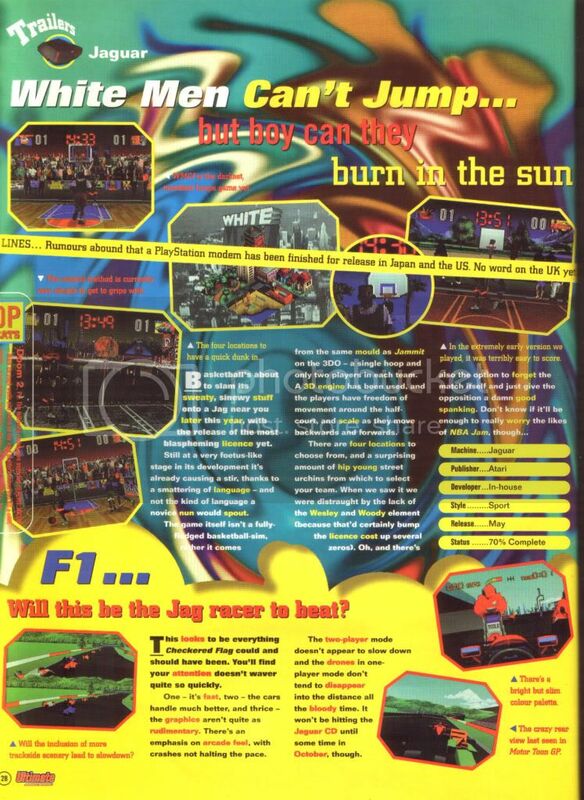 Page 28 - White Men Can't Jump and F1 Trailer. 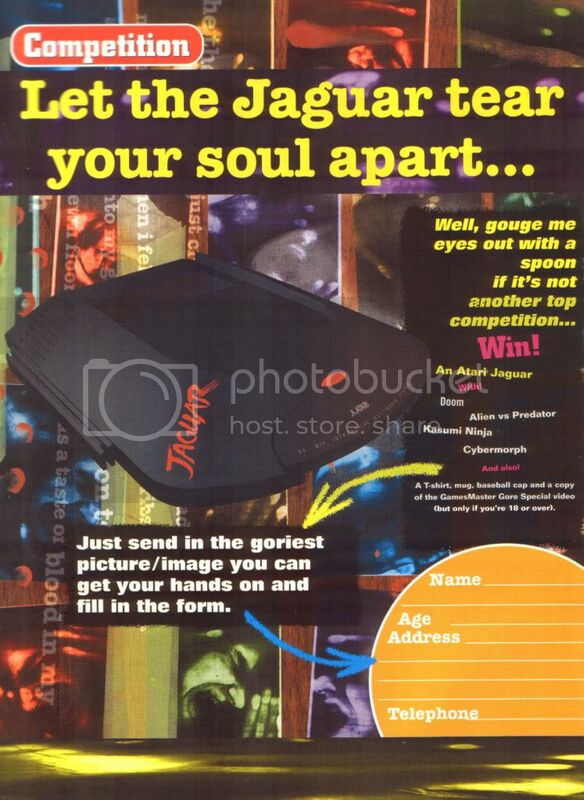 Page 29 - Jaguar Competition. 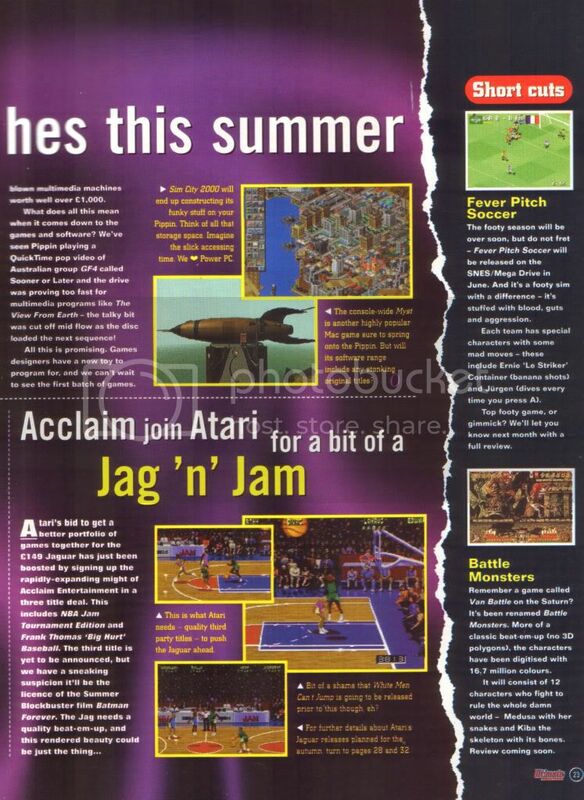 Page 32 - Dactyl Joust, Defender 2000 and Super Kart News. Page 38 - Readers Letter. 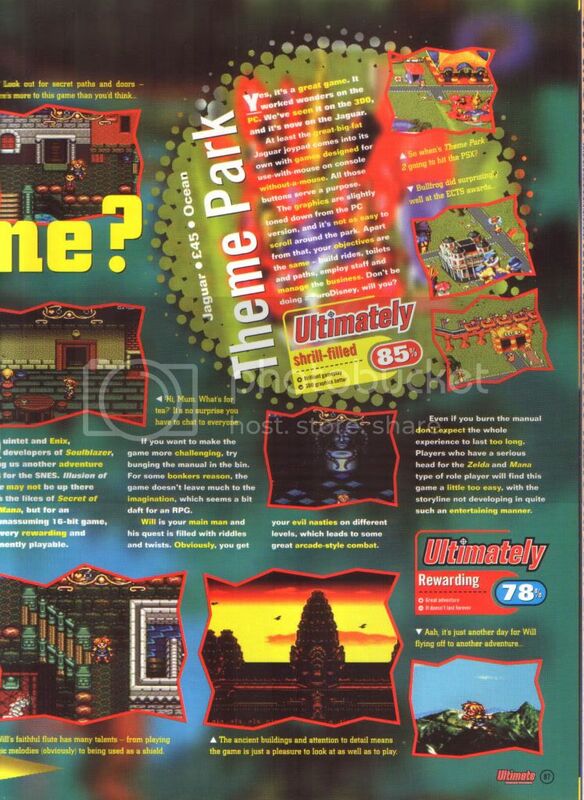 Page 87 - Theme Park Review. 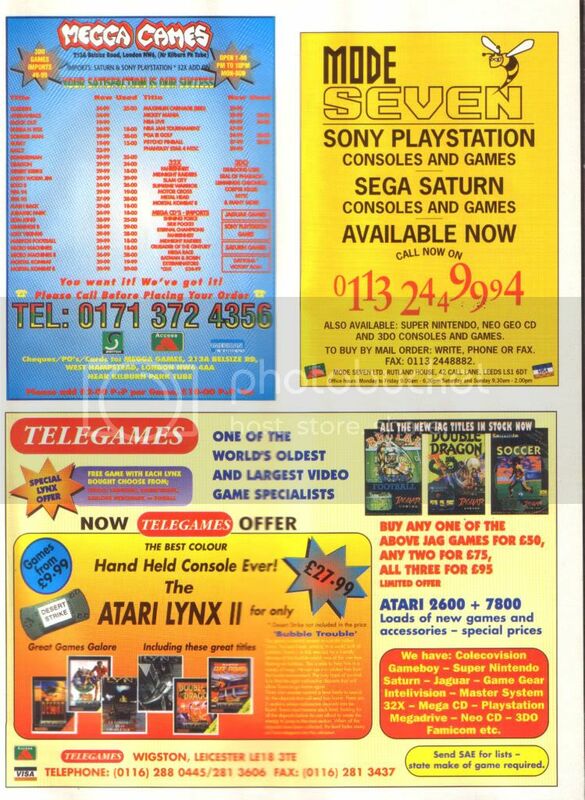 Page 94 - Telegames (UK) Advert. 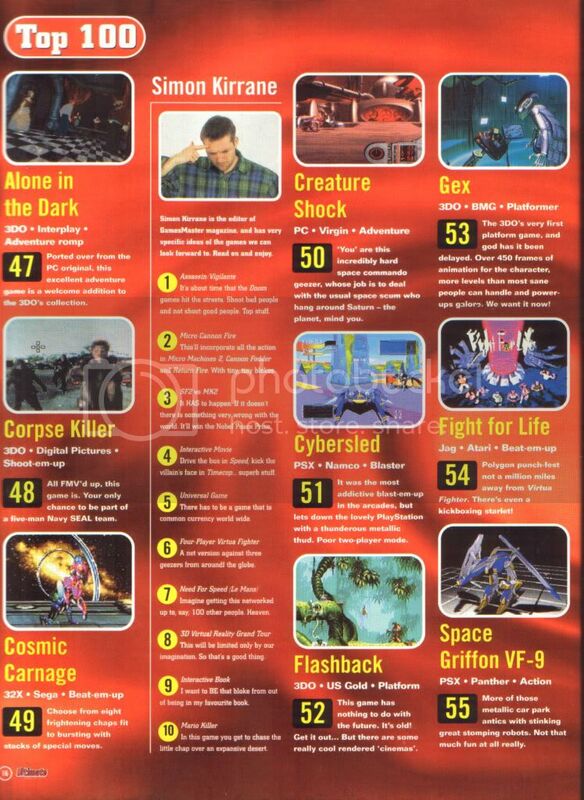 Ultimate Future Games Issue 8 - July 1995. 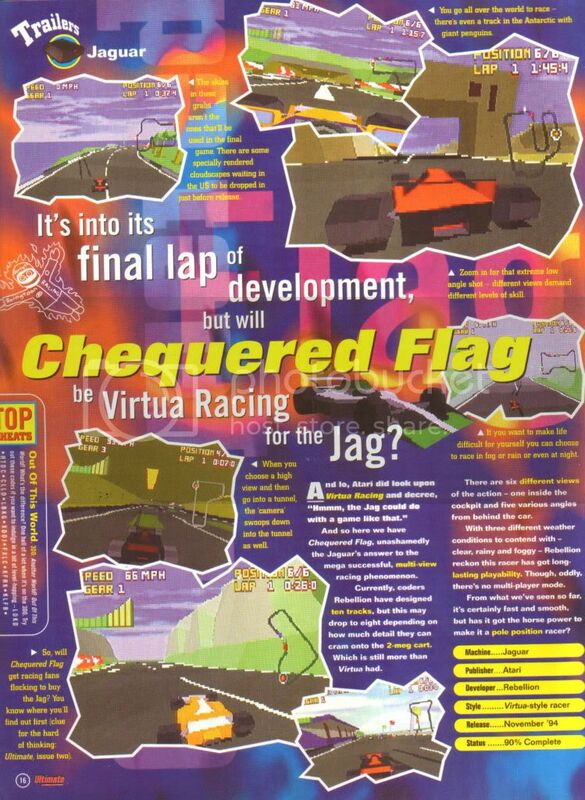 Page 15 - Jaguar VR News. 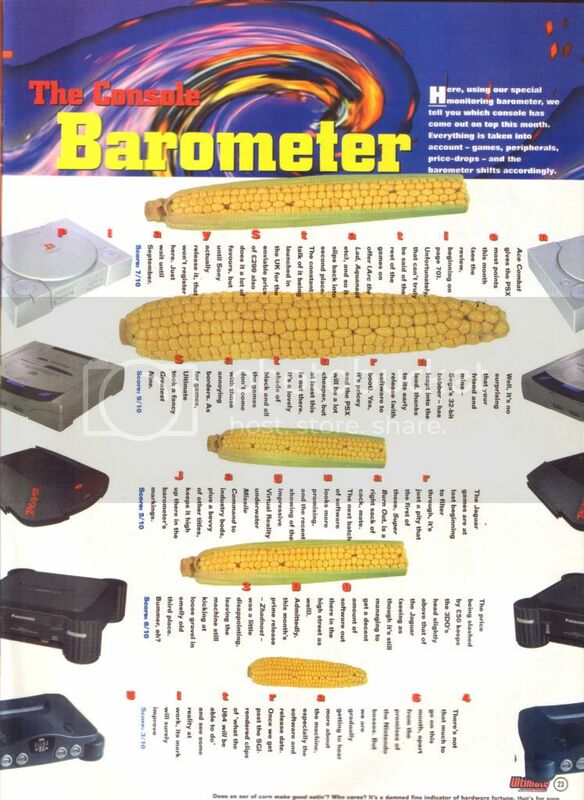 Page 23 - Console Barometer. 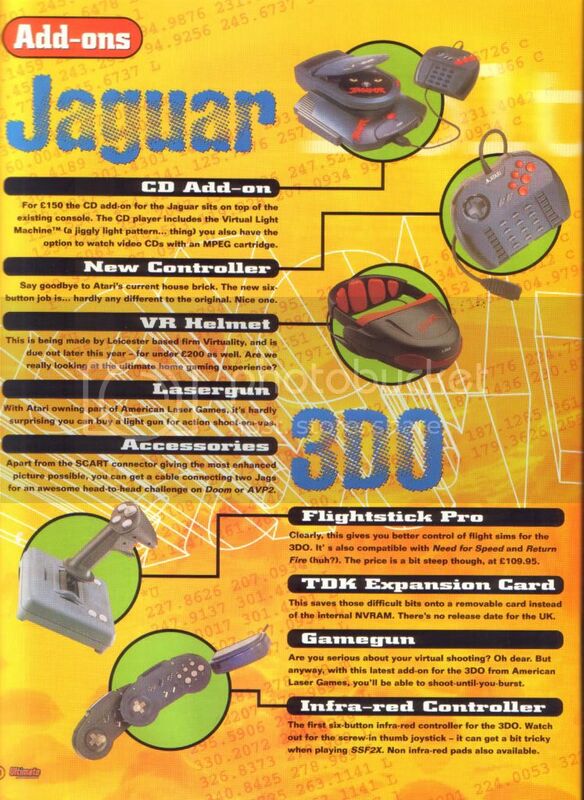 Page 55 - Jaguar Tech Specs. 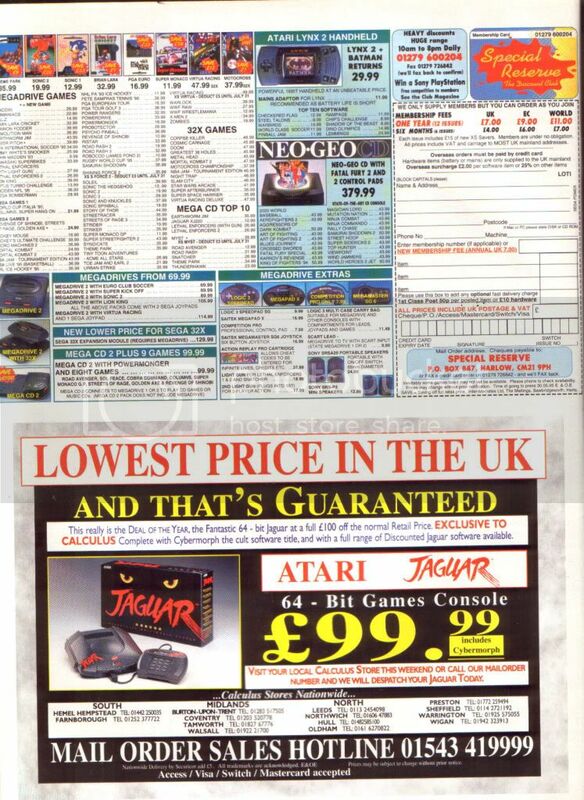 Page 70 - Jaguar Add-Ons. 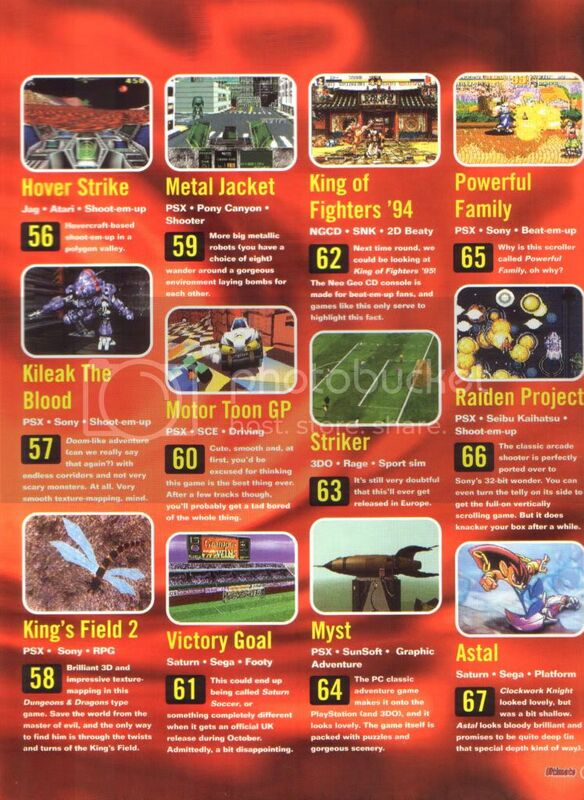 Page 75 - Hover Strike Review. 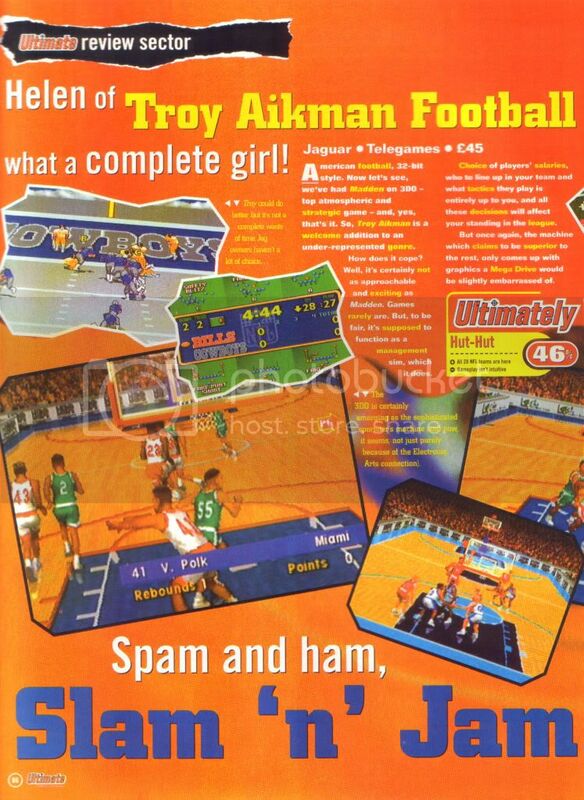 Page 86 - Troy Aikman Football Review. 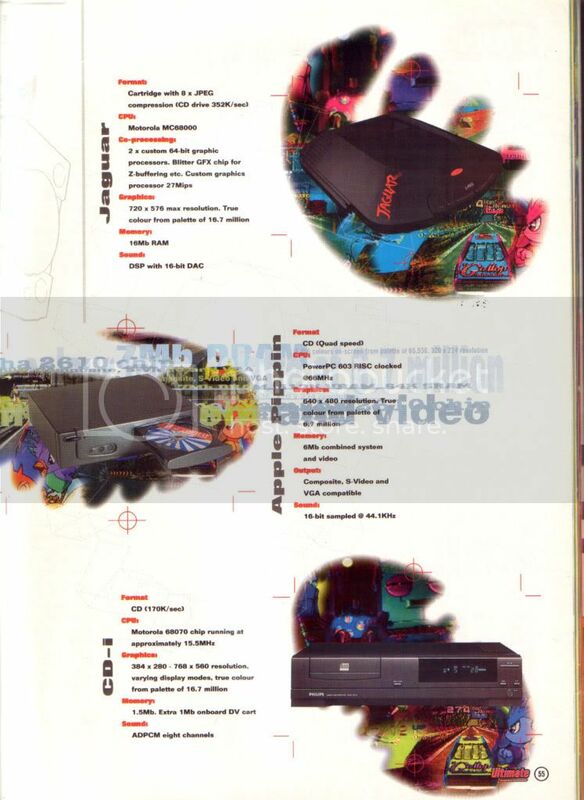 Page 87 - Aircars Review. 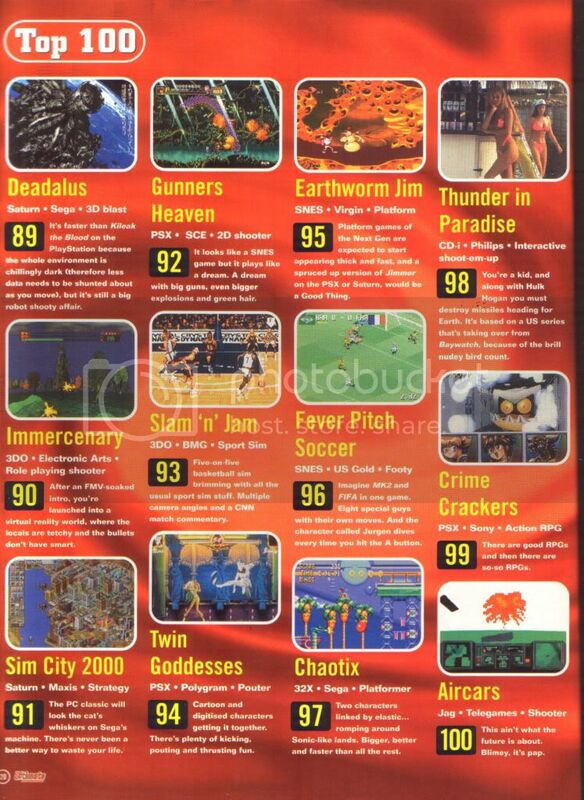 Ultimate Future Games Issue 9 - August 1995. 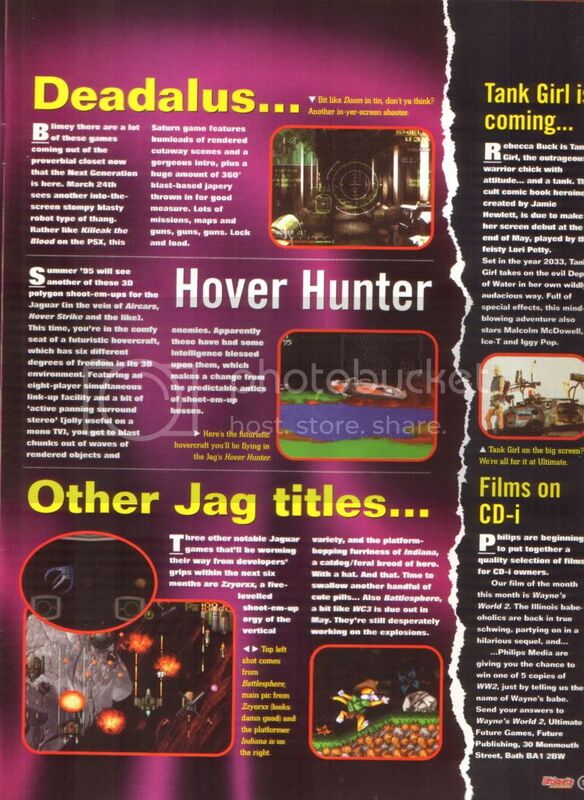 Page 28 - Jaguar CD News. 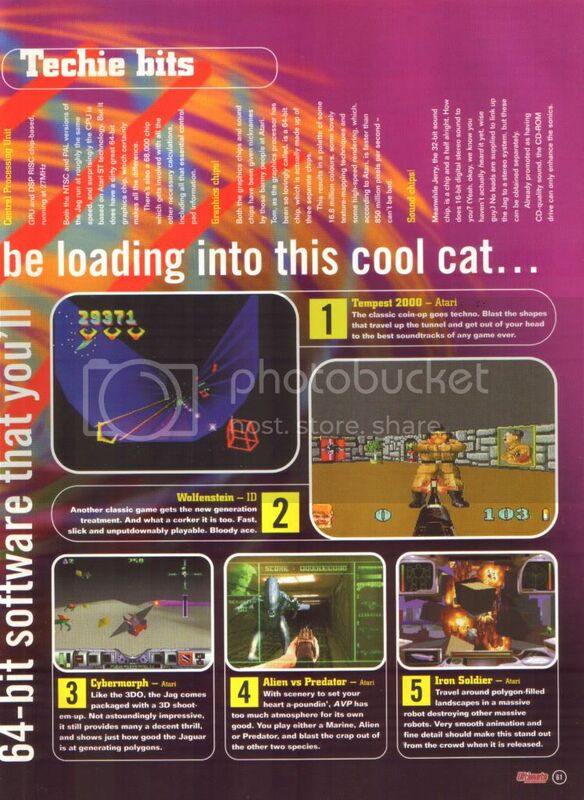 Page 88 - Calculus Advert. 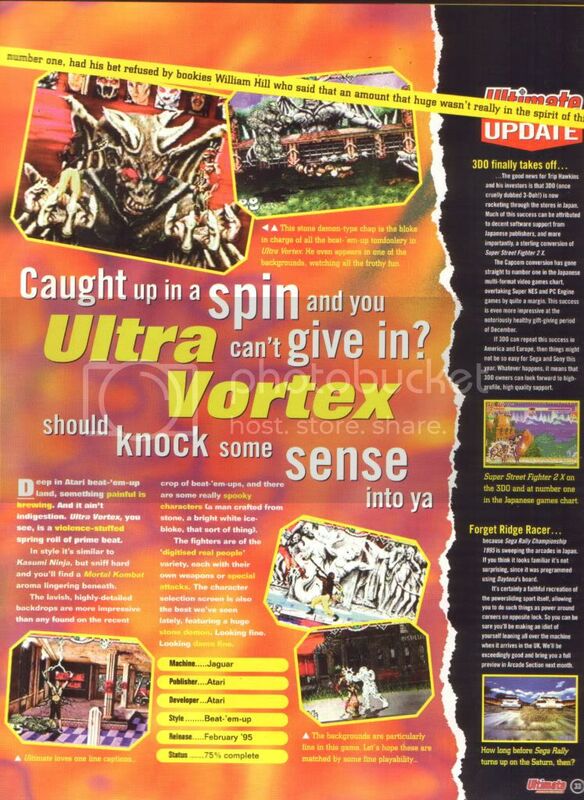 Page 92 - Ultra Vortex Review. 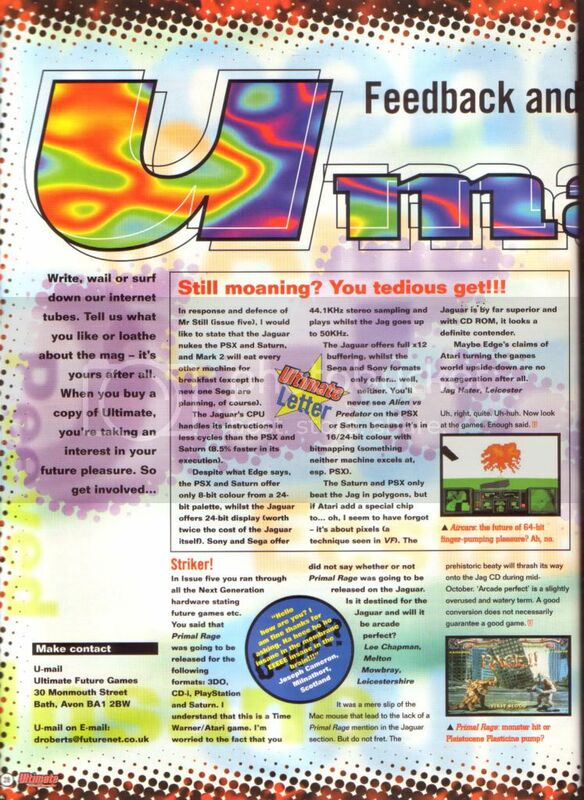 Ultimate Future Games Issue 10 - September 1995. 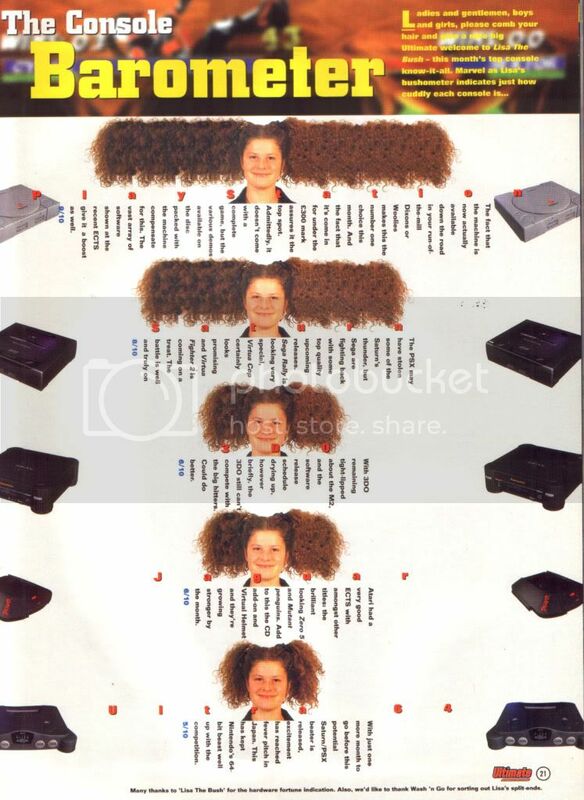 Page 19 - Telegames (UK) Advert. Page 32 - Readers Letter. 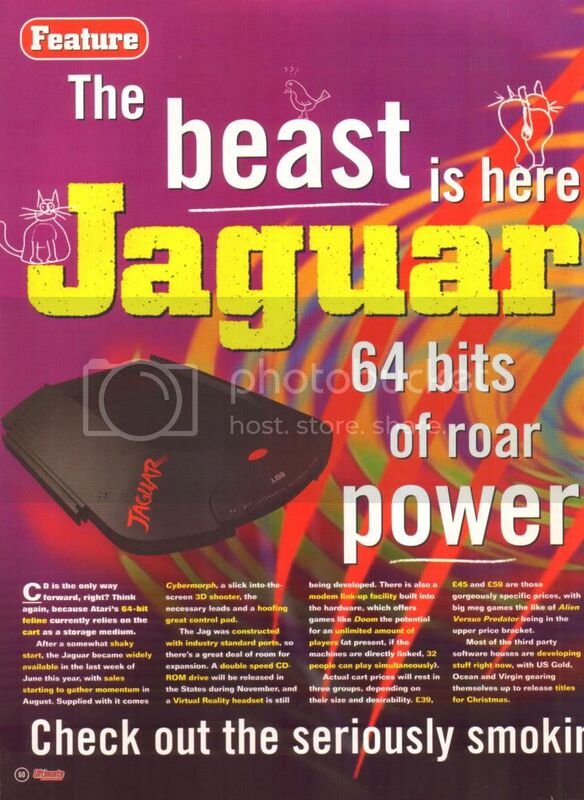 Page 46 - Jaguar VR News. 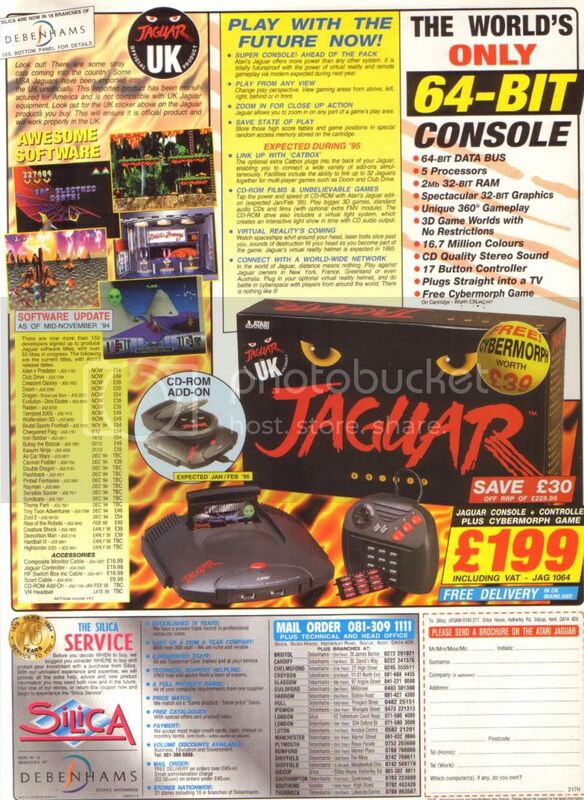 Page 59 - Console War, The Jaguar. 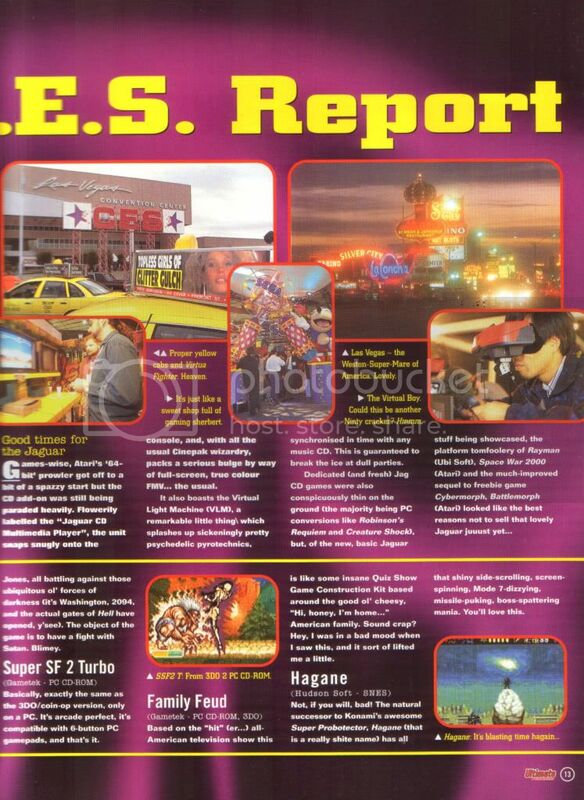 Page 94 - Super Burn Out Review. 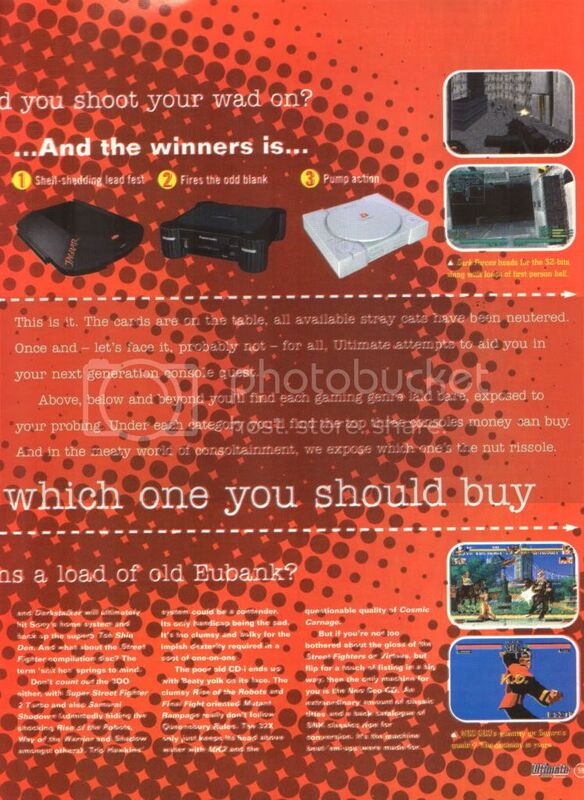 Ultimate Future Games Issue 11 - October 1995. Page 33 - Readers Letter. 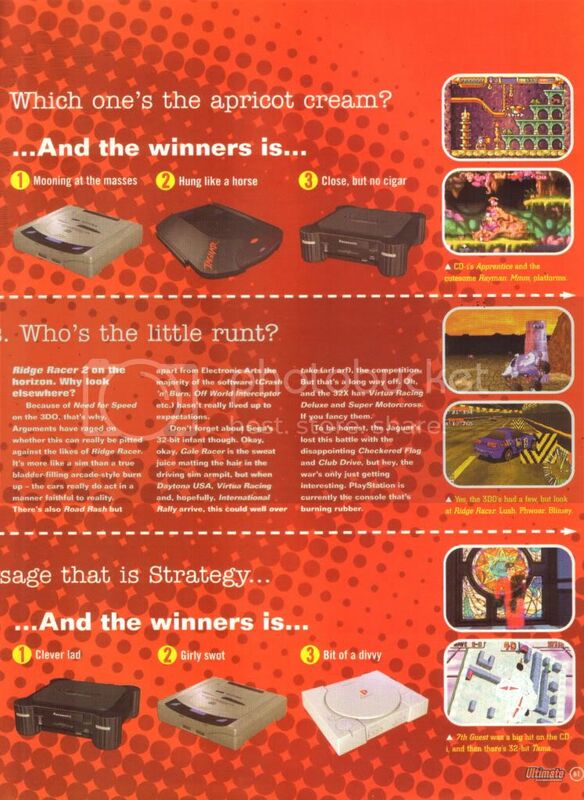 Page 61 - Console Testing. 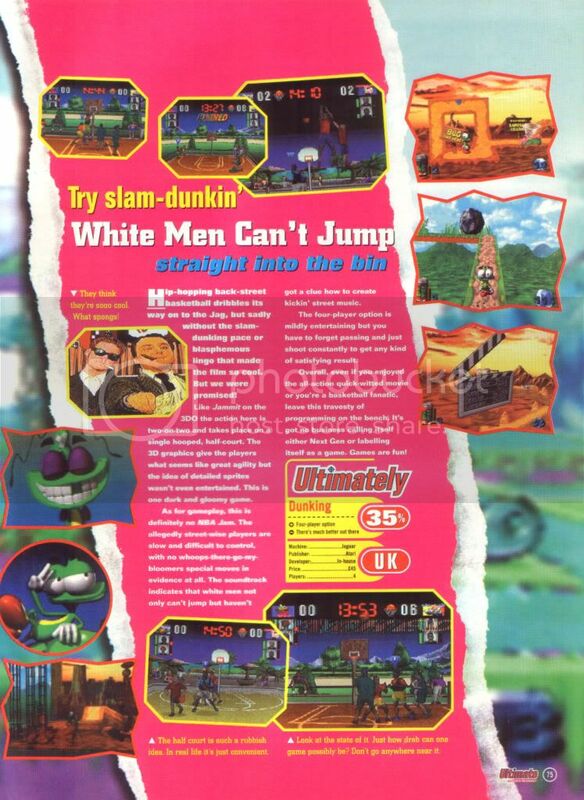 Page 75 - White Men Can't Jump Review. 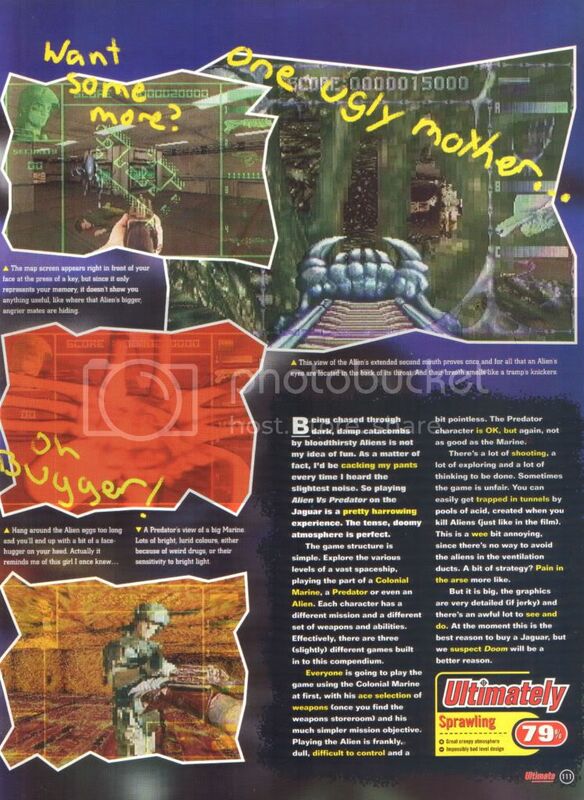 Ultimate Future Games Issue 12 - November 1995. 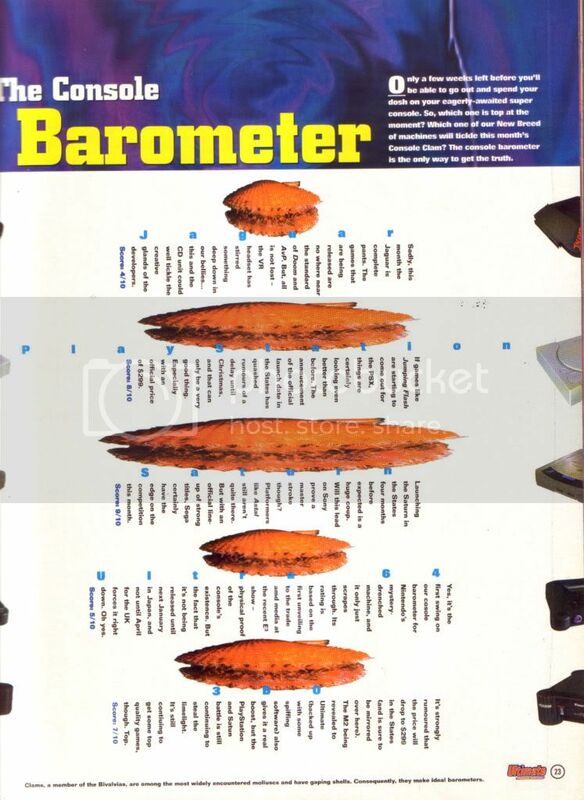 Page 21 - Console Barometer. 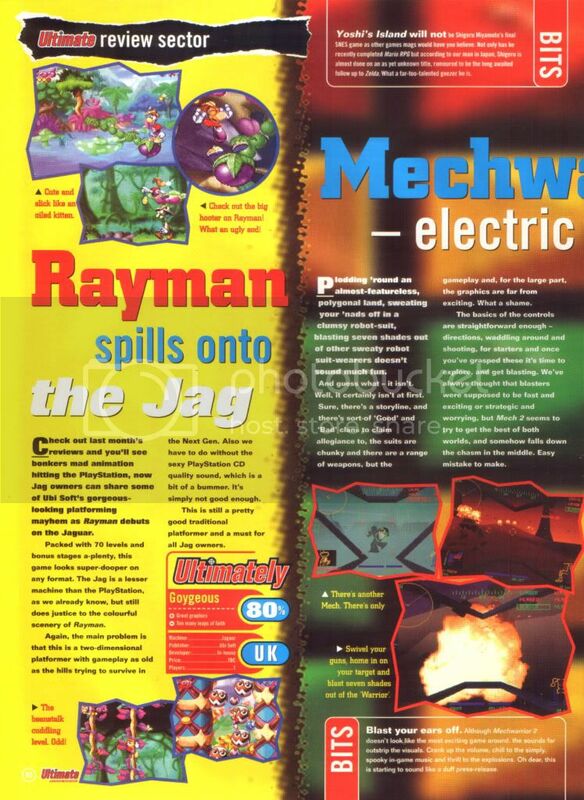 Page 80 - Rayman Review. 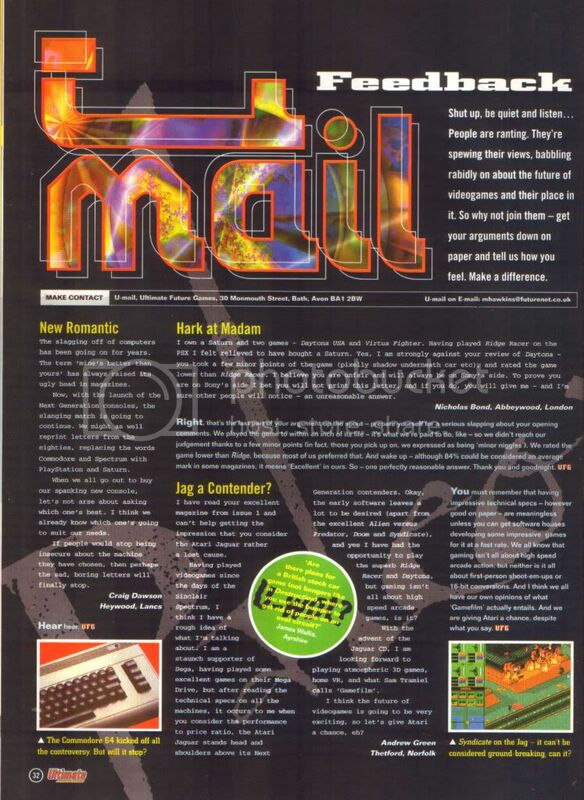 Page 96 - Readers Letter. 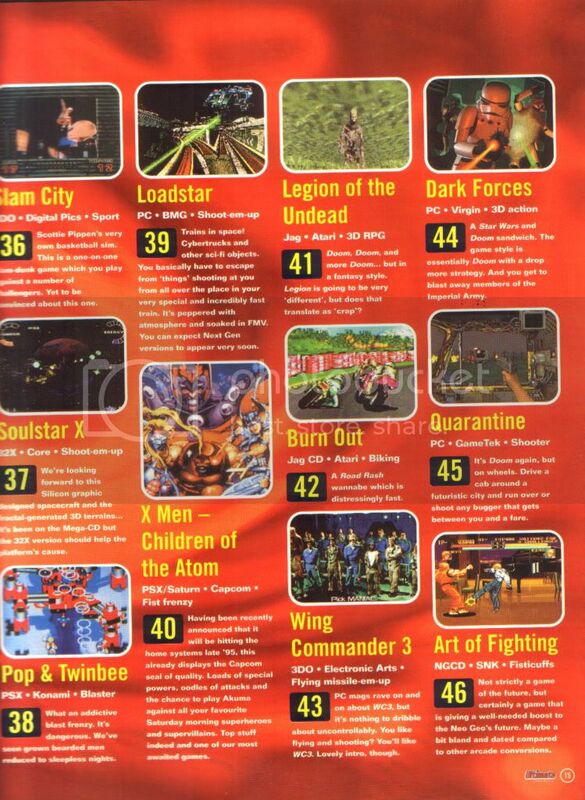 Ultimate Future Games Issue 13 - December 1995. 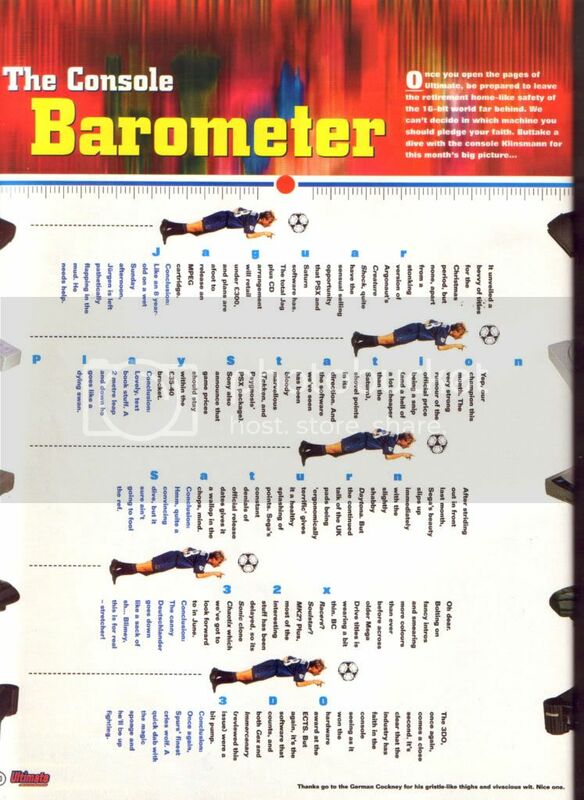 Page 35 - Console Barometer. 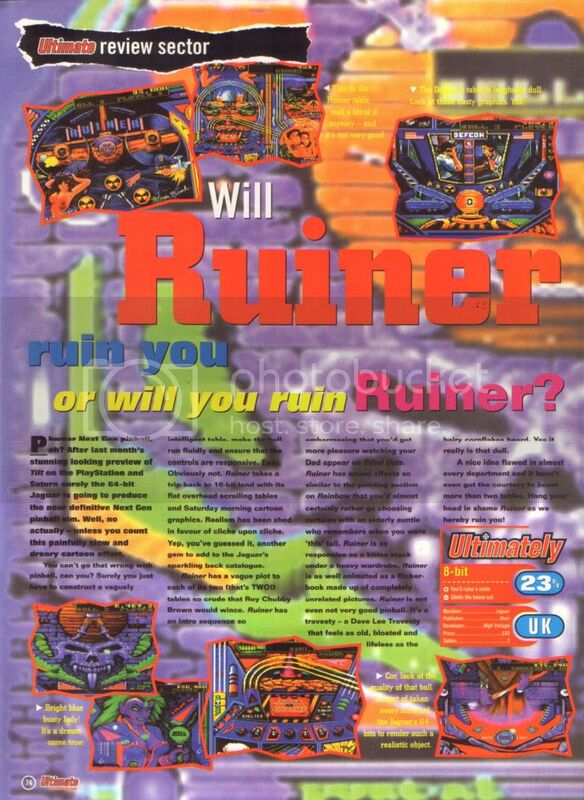 Page 74 - Ruiner Review. 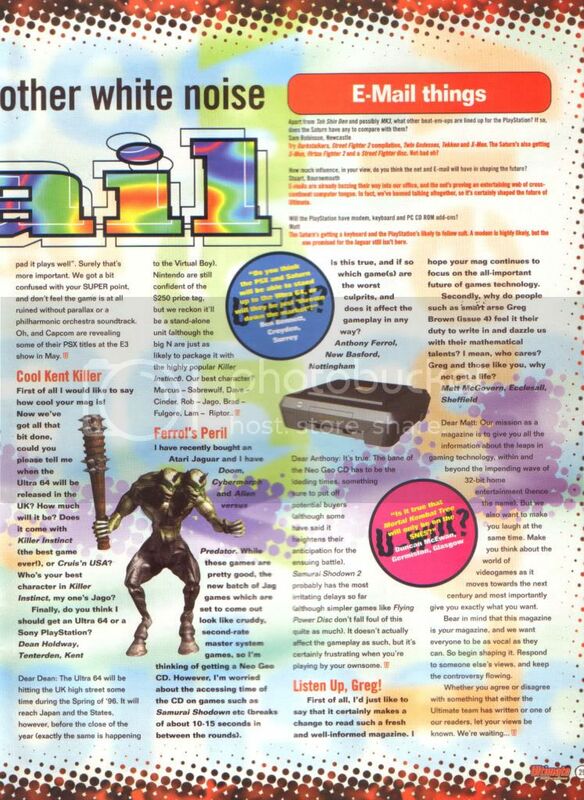 Page 75 - Pitfall: The Mayan Adventure Review. 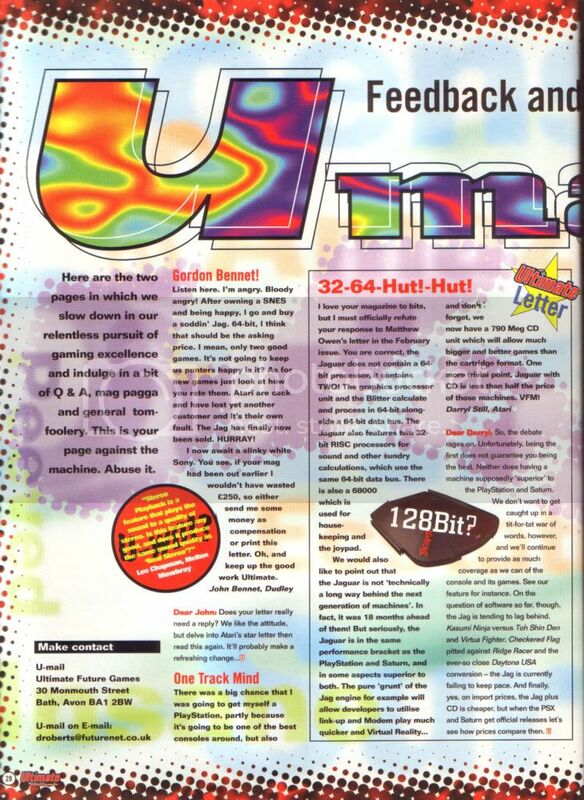 Page 97 - Readers Letter.